The sun didn’t reach my tent as I was tucked into a big hedge so I had to dry it before I left. The campsite wasn’t at the smartest end of town, tucked in the Sheepcote Valley. Luckily I passed a shop to get something to eat as I had gone without dinner last night. 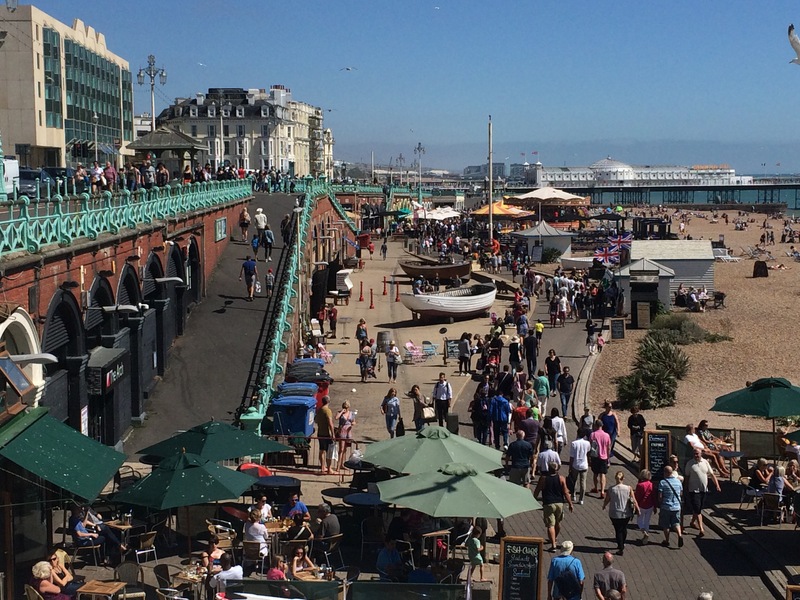 Brighton Marina has been renovated into a shopping complex and a housing estate, as well as berthing boats. 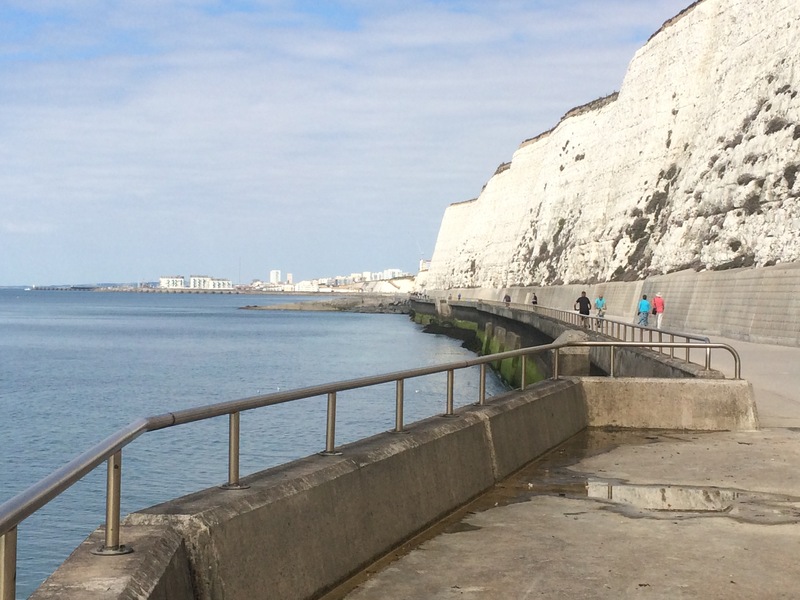 The chalk cliff began at the marina and there was a path along the Undercliff past all the deans: Roedean, Ovingdean, Rottingdean and Saltdean. I decided to forgo the view from the top of the cliff and walk down by the sea. It was a popular path and there were lots of joggers using it. The Black Rock cliff preserves one of best and most accessible sedimentary records of ice age climate in North West Europe. It is hidden away at the back of Asda at the marina. 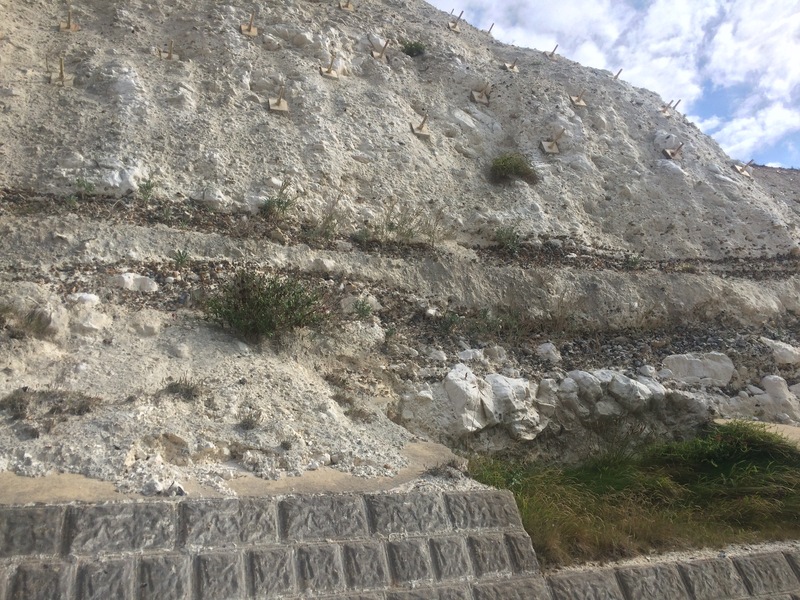 I thought it was quite impressive and clearly showed sandy cliffs becoming chalk and a visible Flint line that was a beach 250,000 years ago. All this history stuck at the back of a modern superstore. 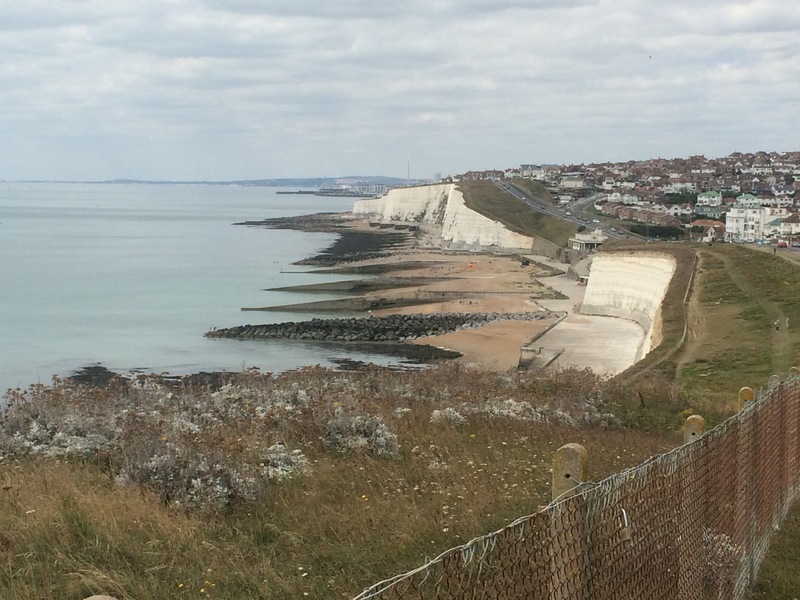 At Rottingdean I came up into the town that was once the seaside home of Rudyard Kipling. I walked up the high street to a pub and went for a second breakfast, coffee and the chance to charge my phone. It was also a nice break from the heat. 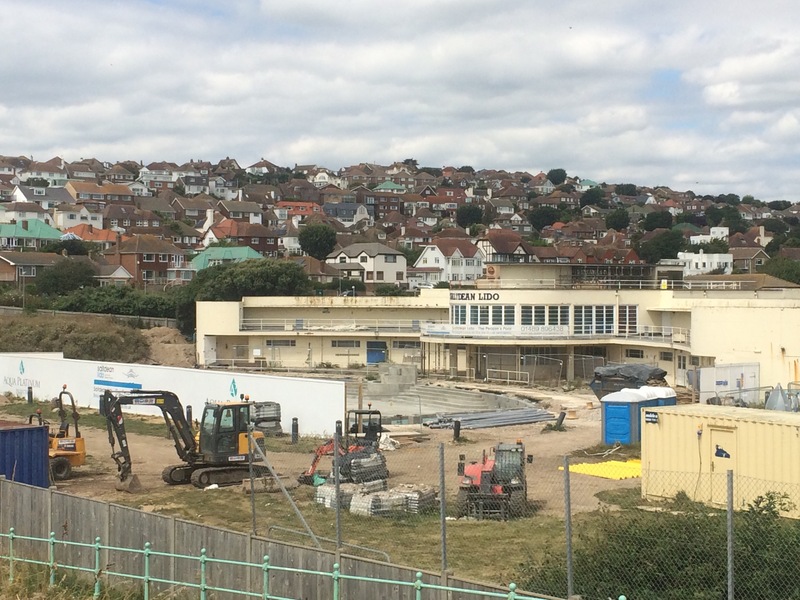 I wanted a look at Saltdean’s lido; it wasn’t what I expected as it was undergoing renovation. From here I stayed on the top of the cliffs and admired the view. The sea looked, and sounded, lovely. 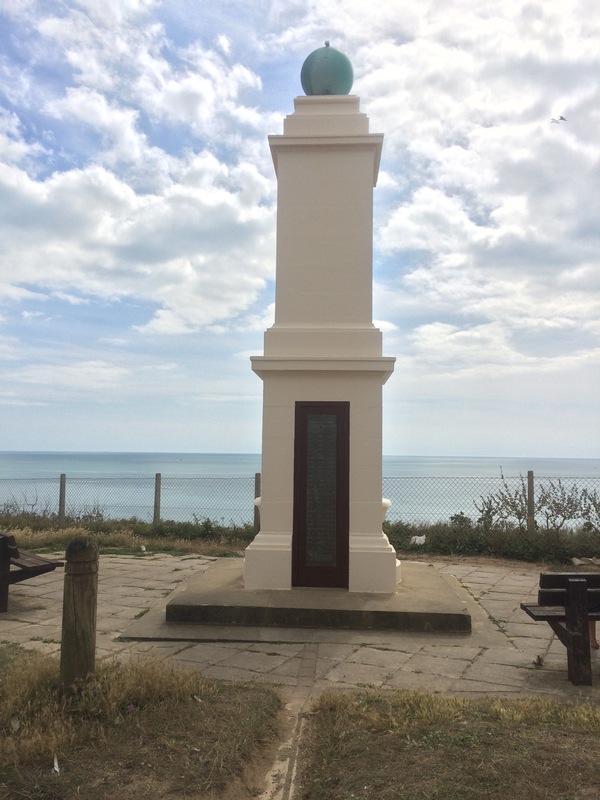 Peacehaven had a monument to signify where the Meridian Line passes through; 48 miles to London as the crow flies. 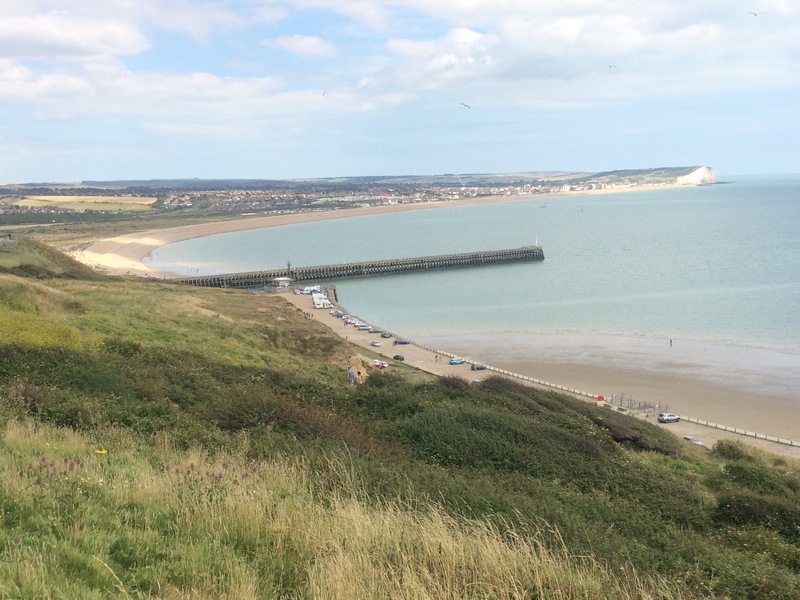 Approaching the Newhaven Fort, the guardian of the entrance to the River Ouse and the ferry terminal, the views were excellent. 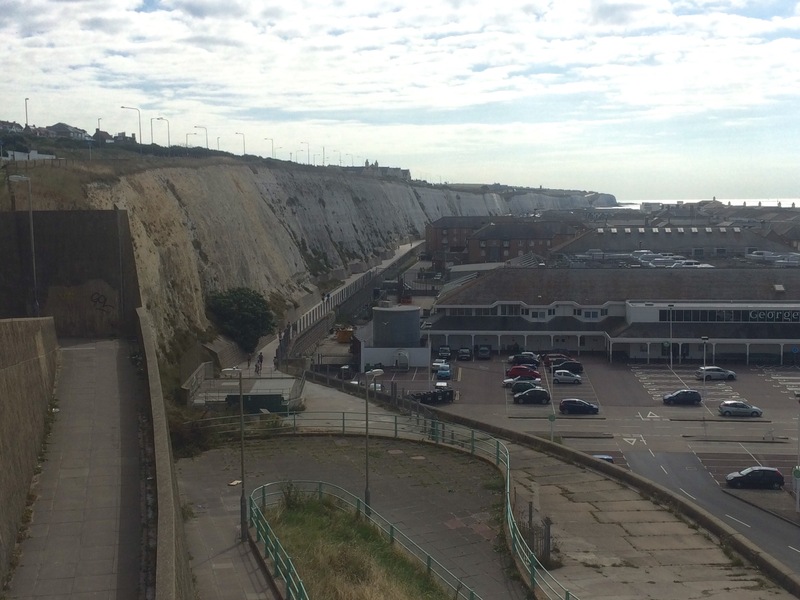 I could see the huge, white cliff of Seaford Head across the mouth of the river. 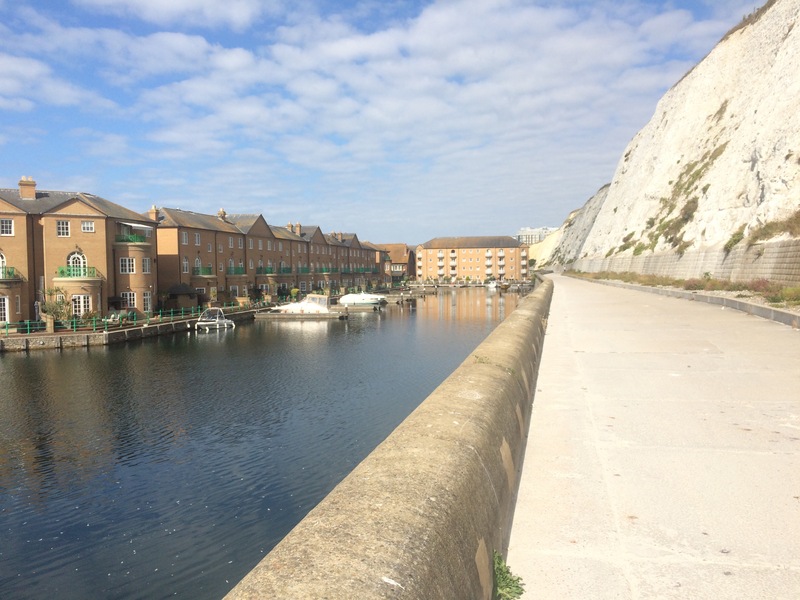 I had to go a mile inland, into the centre of Newhaven, to cross the River Ouse. As I approached the bridge I noticed a ceremony taking place. 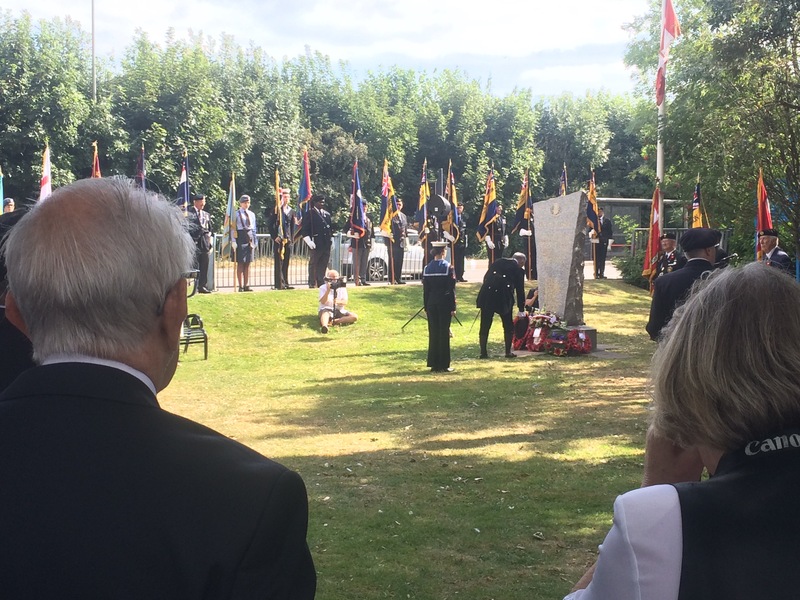 I went to take a look and stayed to watch the annual Ceremony of Remembrance commemorating the 1942 Dieppe Raid. Lots of wreaths were laid and the sound system failed so the audience had to sing the Canadian, French and British national anthems without help. The first 2 were a challenge. At the end of the ceremony the vicar came over and chatted to me and then ‘Lonney’ came and asked me about my walking poles. 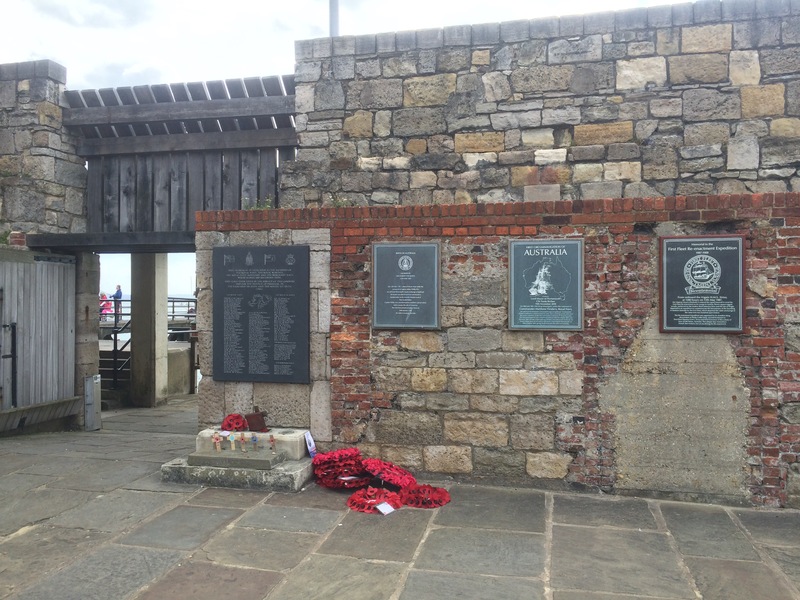 He was in his 90s and a veteran of the Dieppe Raid. What a privilege to chat to him. 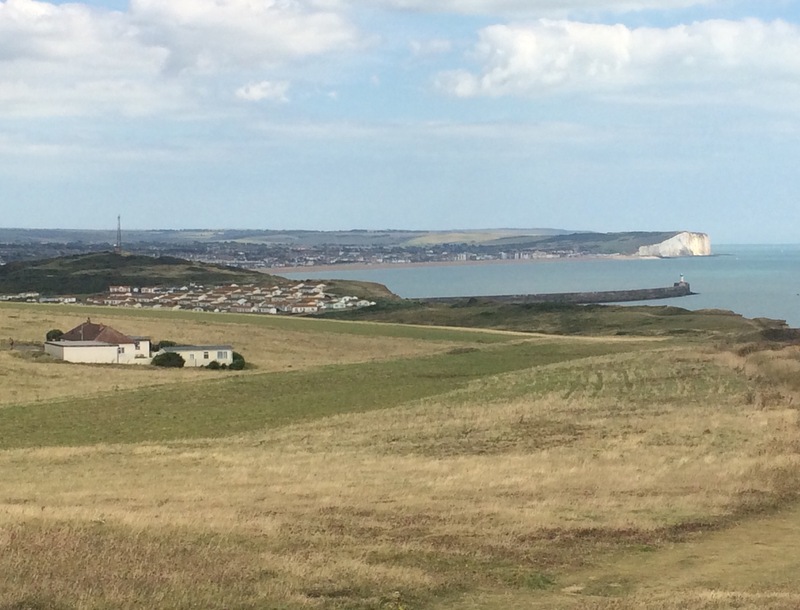 It was well after 5pm when I finally arrived at the campsite, on the edge of Seaford. 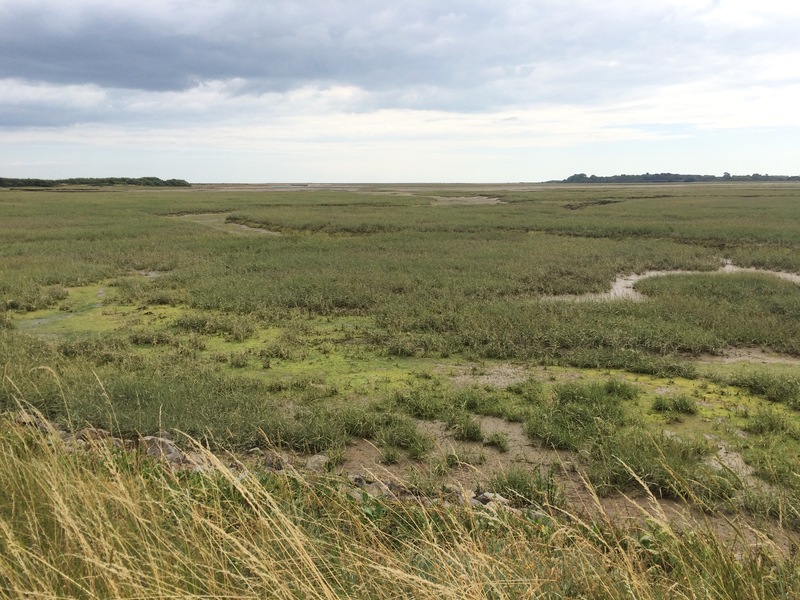 The land on the East of the mouth of the River Ouse was very low-lying and had the remains of dwellings. Originally the river flowed along here but a huge storm in the 18th Century burst through the shingle and straightened the river. 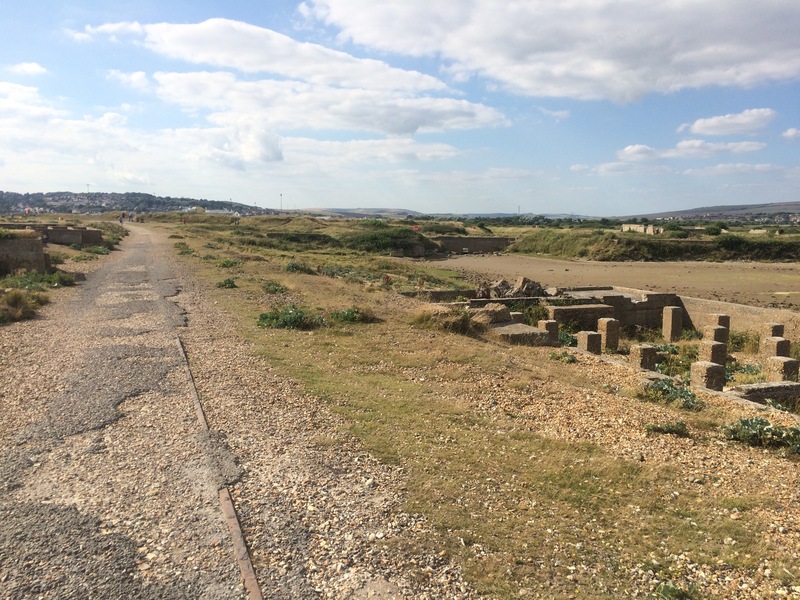 Tidal lagoons were left behind but these have slowly been drying up and so the Tide Mills have long since closed. I pitched my tent, showered, hand-washed my clothes and then walked into town to the nearest pub for some decidedly average food. By the time I walked back in the dark the night fishermen were out in force on the shingle beach. After walking such a long way already this week it was nice to enjoy a lazy morning before my early afternoon train back to Brighton. I wasn’t sure how far I was going to walk in the afternoon. Despite the South-East train strikes that had been going on earlier in the week, my train was on time. I picked up my bag and got on board. 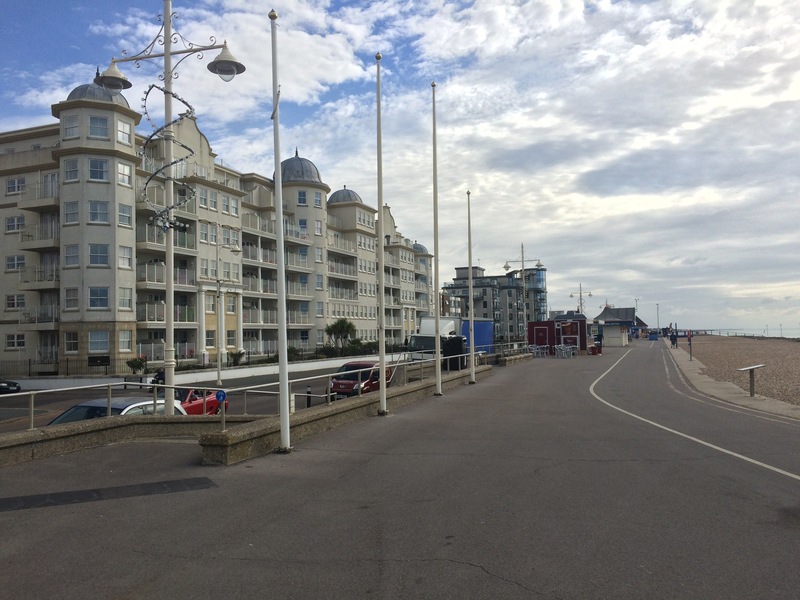 It was only when I arrived at Brighton and picked up my bag to disembark that I realised I hadn’t got my walking poles. Where were they? I must have left them on the platform at Clapham Junction. That was the second time is left my poles behind when catching a train (remember Barrow-in-Furness?). This time I was able to get a station worker to phone Clapham and my poles were still there. Phew. The bad news was that I had to go and collect them so I endured another round trip to Clapham Junction and back. What an idiot. 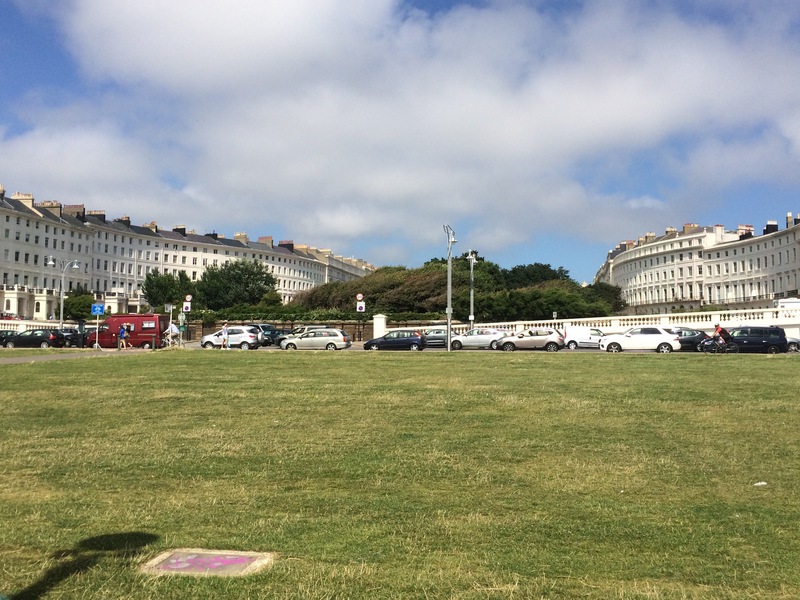 I’m so glad I retrieved them though, and relatively easily, as I couldn’t put my tent up without them and the cheapest bed and breakfast in Brighton was well over £100. 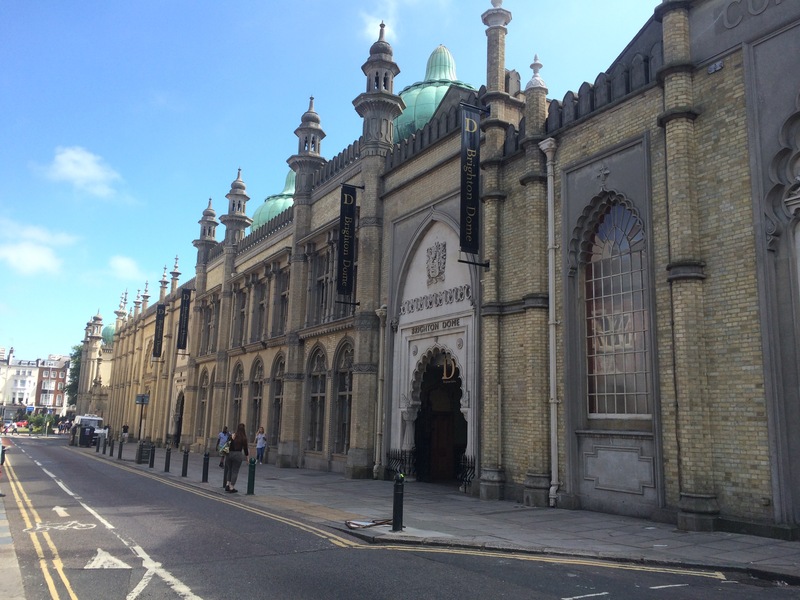 It was almost 6pm when I finally left Brighton train station. 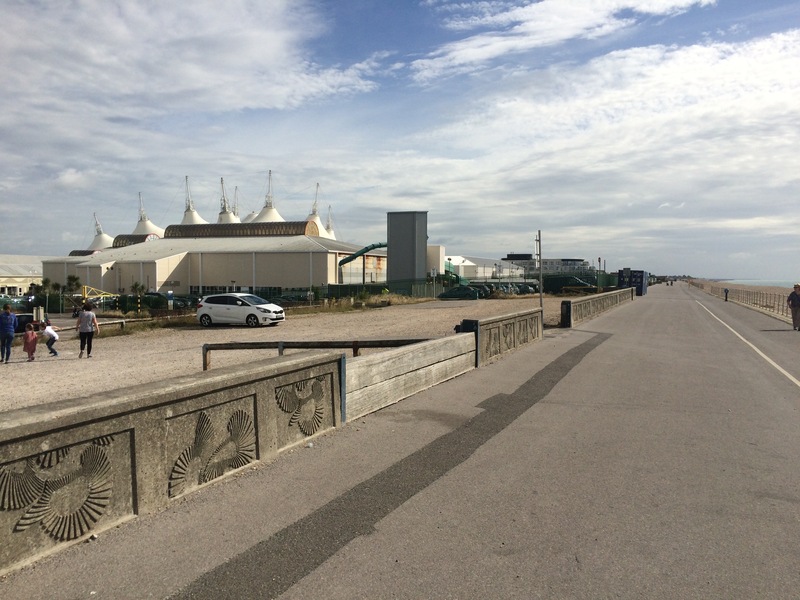 I walked down to the sea front and along the esplanade to the Marina before turning inland to the only available campsite. It was my most expensive campsite stay at £26.40 for 15 hours. There was nothing I could do and I was tired so I put my tent up and went for an early night. I didn’t get much sleep as I pitched next to a group of profoundly deaf people who started barbecuing at 10 pm. They were incredibly noisy, which I guess was because they couldn’t hear how loud they were. I was too tired to care. Sarah had made me an amazing packed lunch; I think it doubled the weight of my rucksack. 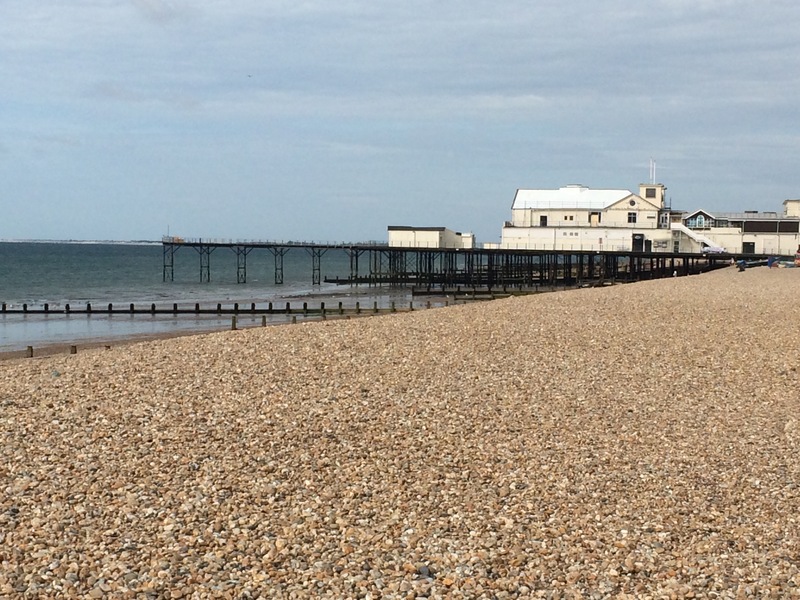 Phil drove me back to Shoreham Beach and drove me around. I was amazed how many houses there were here. 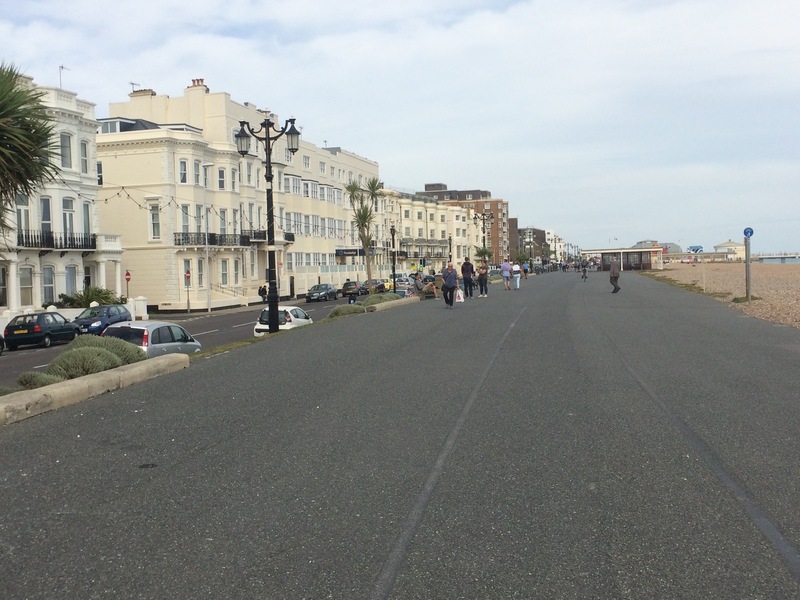 It reminded me a bit of Sandbanks; there was only 1 road in and out, and it felt quite exclusive along the sea front. It certainly wasn’t an exclusive area back in the early 20th Century when it was known as Bungalow Town. 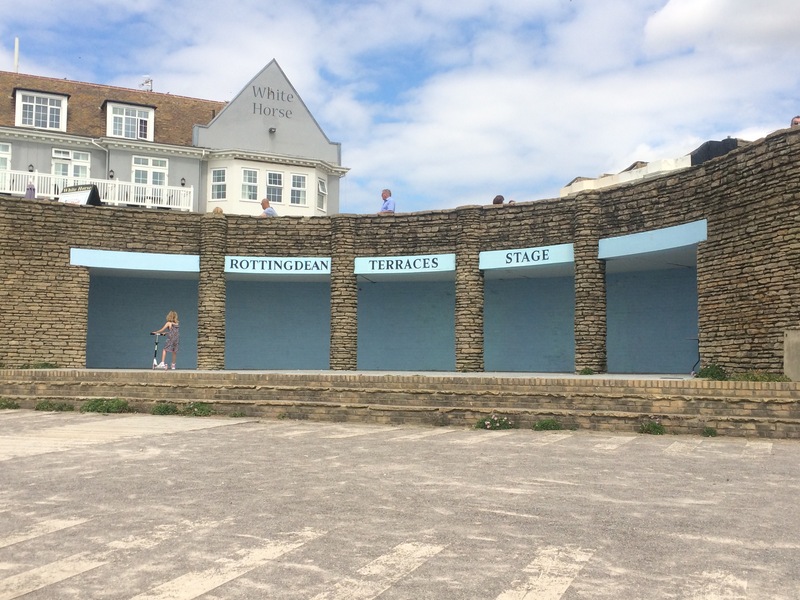 It was developed as a theatre and film colony, and most of the bungalows were made from a couple of old railway carriages with a roof stuck over them. 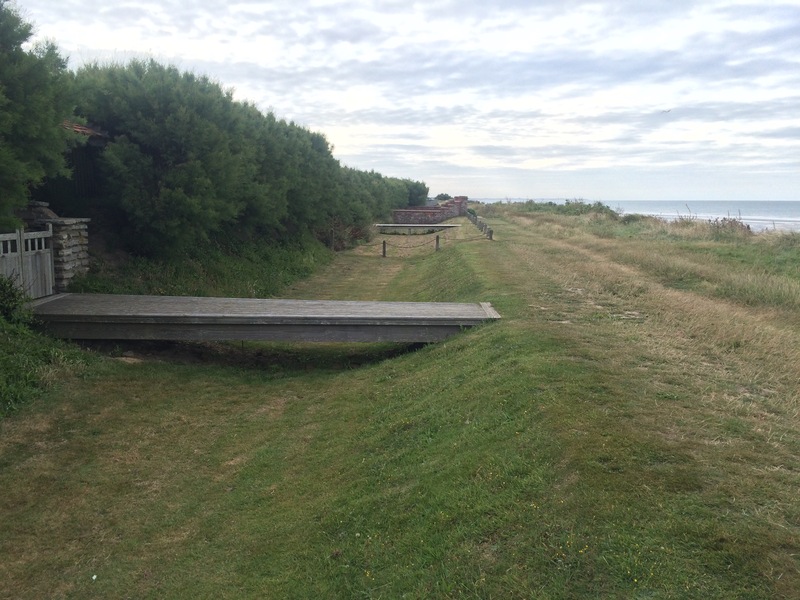 Most of the colony was demolished to make way for WW2 sea defences. 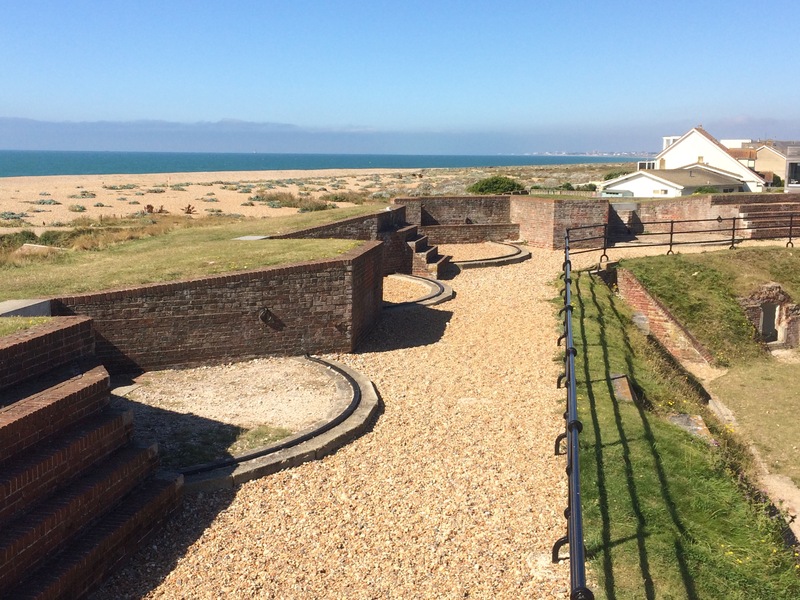 Phil and I stopped to take a look at Shoreham Fort, built in 1857 as one of Palmerston’s forts. 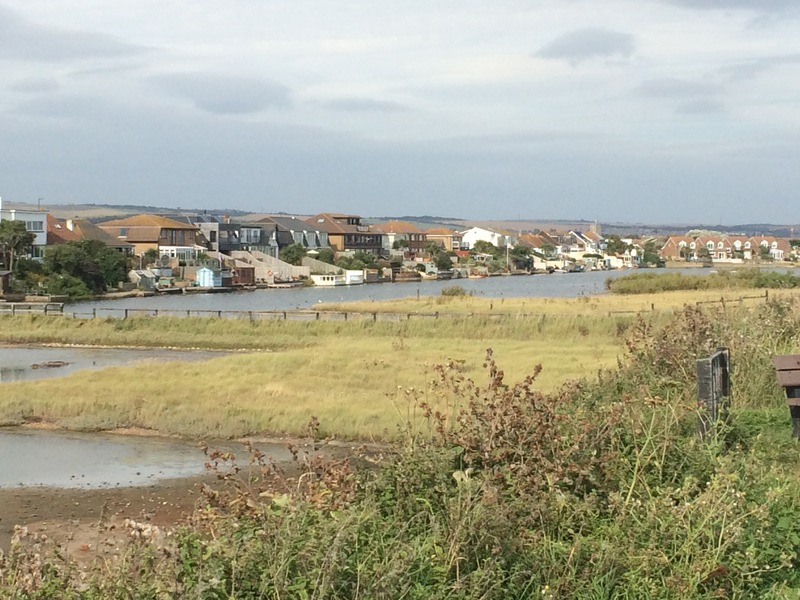 Phil and his mates used to play here as kids, right at the entrance to Shoreham Port and the River Adur. Phil dropped me off next to the pedestrian bridge across the river into Shoreham town centre. He recommended I take a look in the Marlipins Museum, so I did. 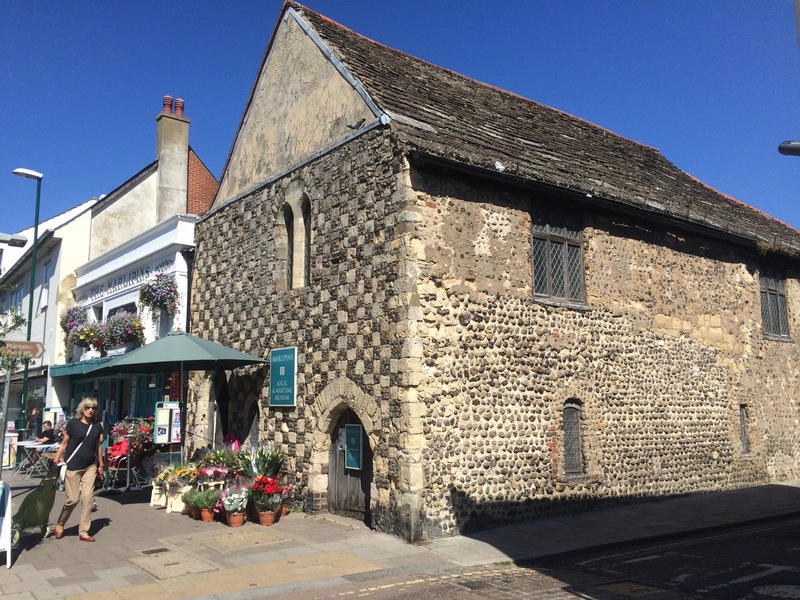 There was a great exhibition about the Mystery Towers that were built in Shoreham during WW1. The Admiralty had a plan to block off the English Channel from German submarines by positioning defended, concrete towers in a line across the Straits of Dover. They were to be constructed at Shoreham but only 2 were built before the war ended. It was obviously impossible to hide such large structures from view so there were plenty of photographs, and even postcards, of these towers. Such an amazing feat. 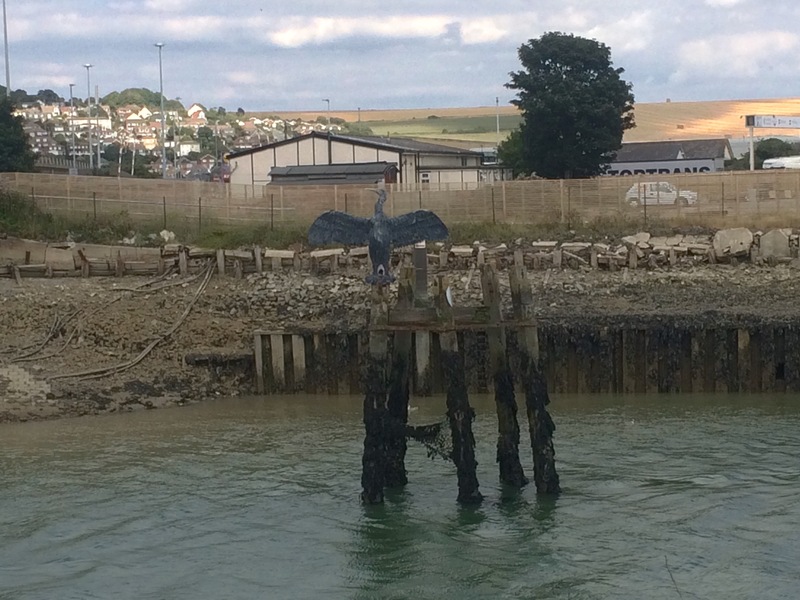 I had to follow the main road to Southwick before I could cross the Prince George Lock, across the harbour to Portslade-by-Sea. 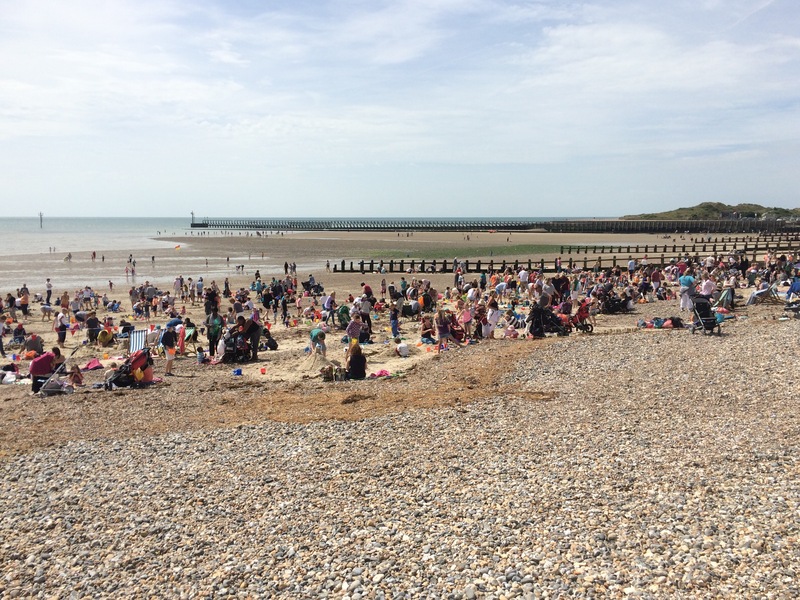 This was the equivalent spit of land to Shoreham Beach, but not as nice. It was an industrial area with a power station and lots of huge lorries driving past me. Not an attractive place, which might be why there was a nudist beach just the other side of the sea wall. 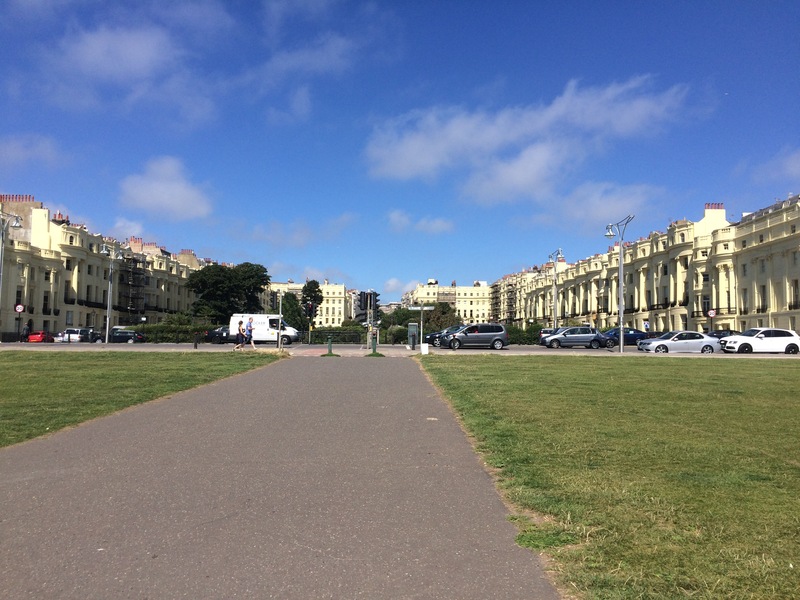 I reached Hove, and the start of the long esplanade that heads all the way through Brighton. I wasn’t alone as there seemed to be hundreds of people walking, cycling, scooting, rollerskating along the lovely, smooth Tarmac. 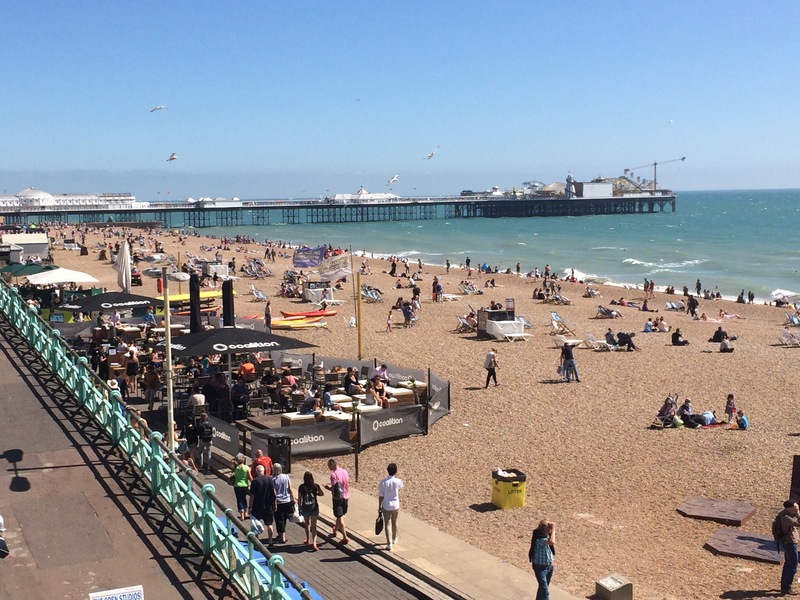 Brighton and Hove city is the most populous seaside resort in the UK and it showed. There were people everywhere. Despite the large numbers of people the city still had a relaxed, bohemian feel to it and it was very brightly coloured. I loved the huge Georgian apartment blocks and the squares filled with trees. 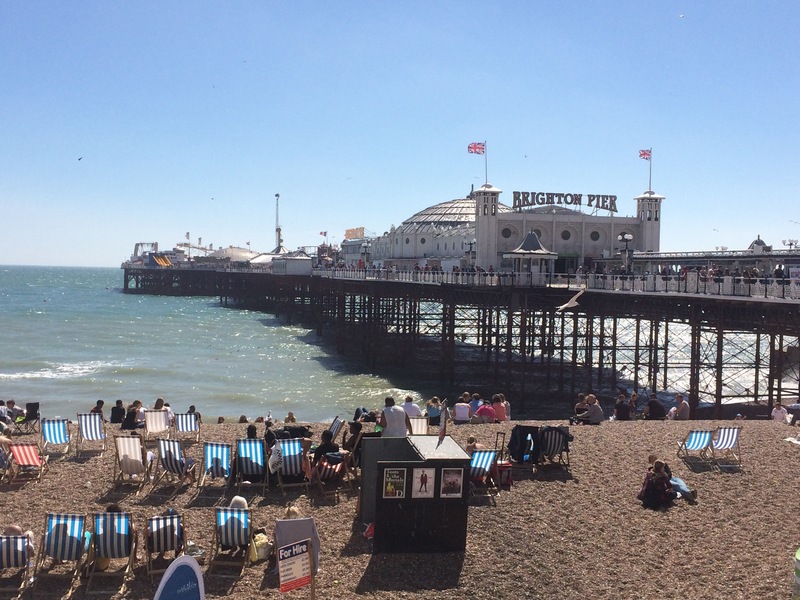 I got as far as the Palace Pier and then headed into the city centre to the train station. 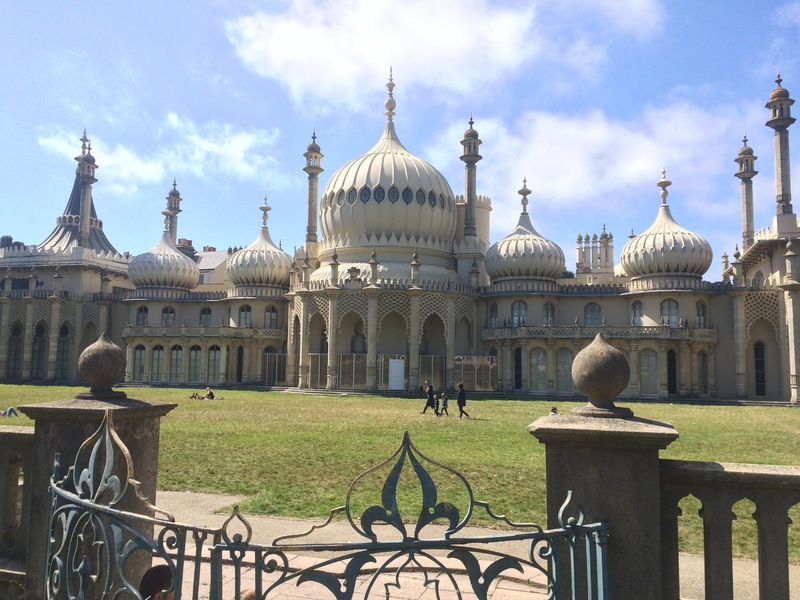 On the way I passed the impressive-looking Royal Pavilion. I also walked down The Lanes, a series of narrow alleyways full of small, quirky shops and cafes. This was a completely different side to the city than the huge esplanade and beach. 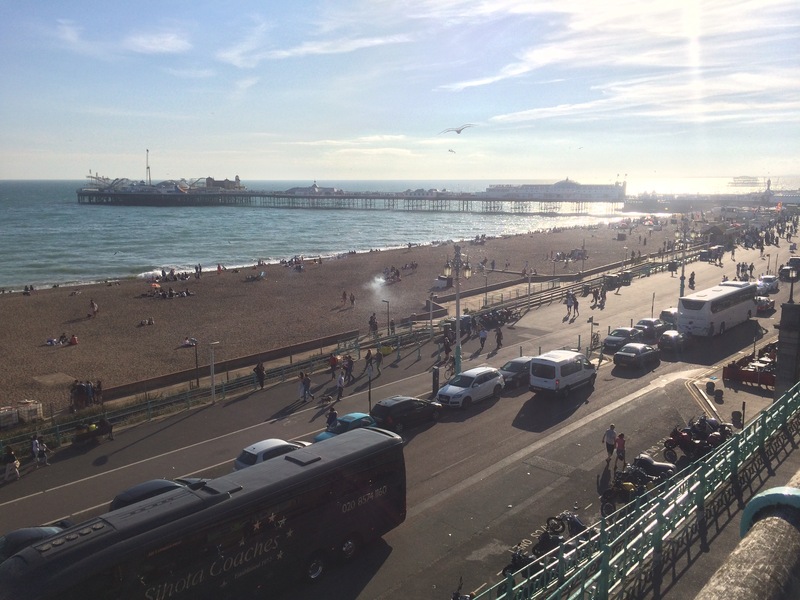 Brighton definitely had a wealthy air to it. Chris and Sonya had invited me to stay with them as it was only a 50-minute direct train into Clapham Junction. I hadn’t seen them for ages so it was lovely to spend the evening catching up over dinner. I was up just after 6 am and walking before 7. 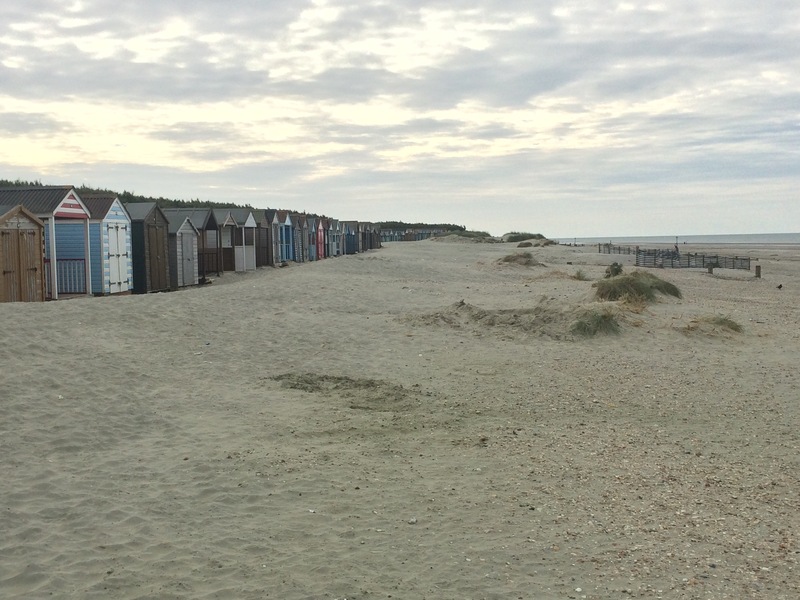 I left my damp tent pitched and set off, minus rucksack, to walk 6 miles across the fields to West Wittering and then back along the coast. This is definitely a moneyed area; the inland houses are big and secluded, and then there are some enormous houses facing the beach. 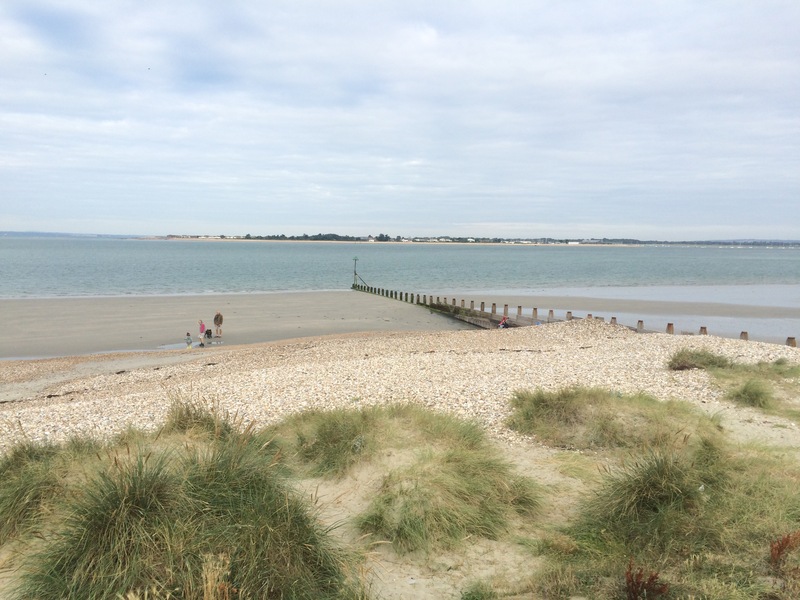 It was very peaceful as I walked through West Wittering to face onto Chichester Harbour again. 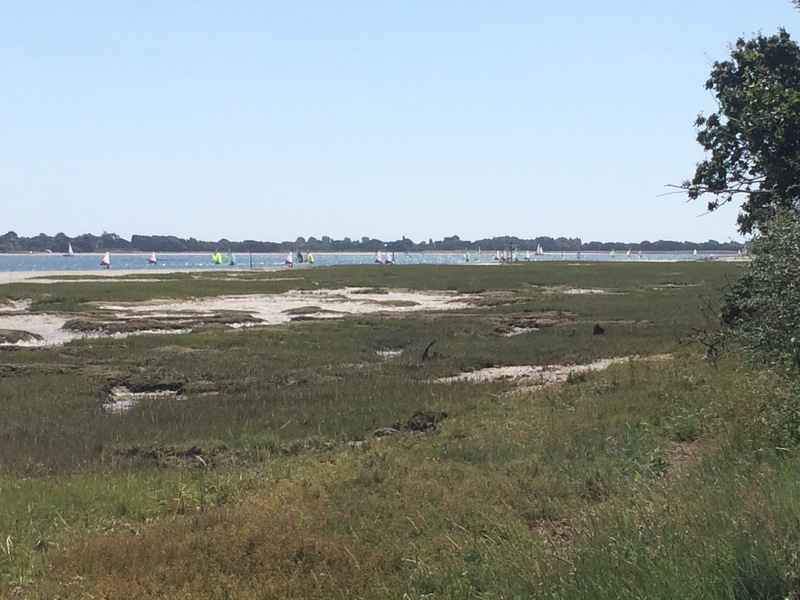 The spit of sand dunes called East Head protects this little area from the main harbour. 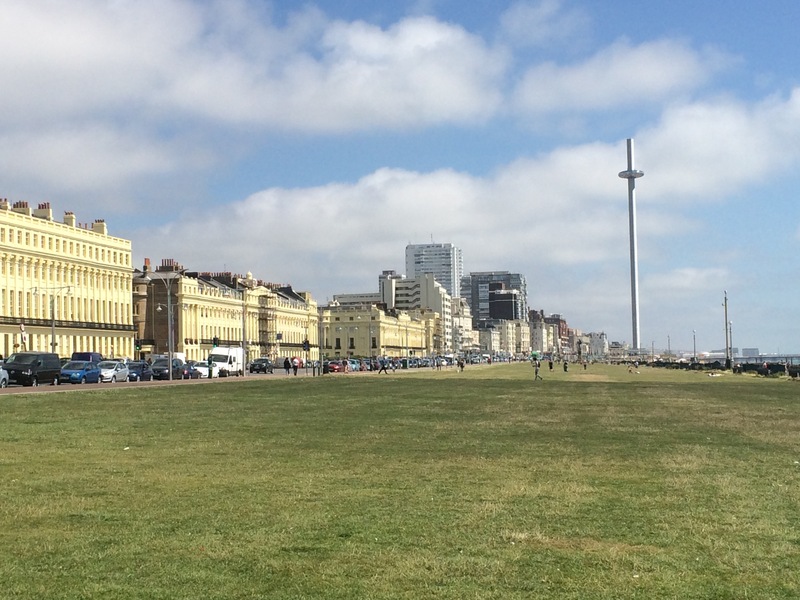 When I walked into the front, facing the English Channel, the wind picked up. 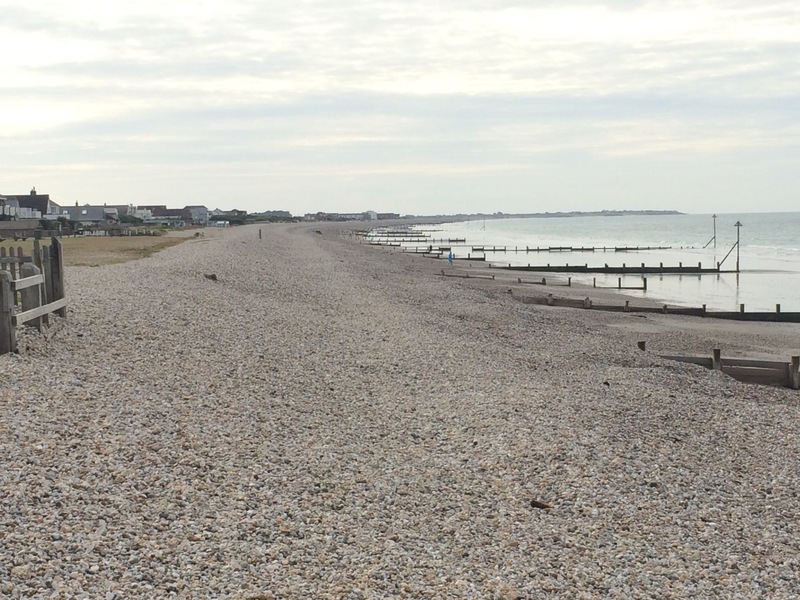 I headed along the beach back to East Wittering. The sand was lovely and fine but a dirty brown colour. Behind the beach were enormous houses, sat in big gardens with a small, dry moat out front and little bridges; a bit like a country pile at the seaside. 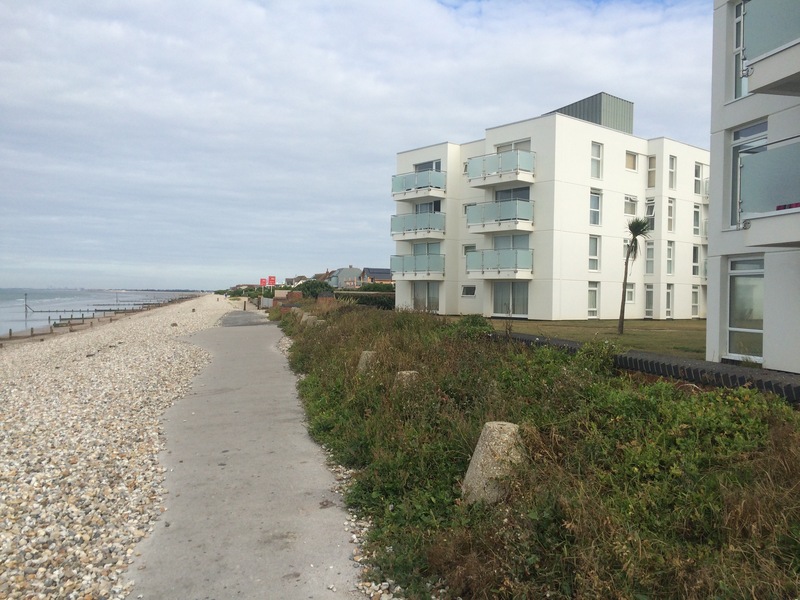 I found it rather amusing to see how the housing changed as I got closer to East Wittering. The large gardens gave way to small ones and the houses, although still enormous, got smaller too. Finally, there were apartment blocks. This was a graduation of wealth from multi-million pound to million pound and then a bit less for an apartment. I stopped at the bakers in East Wittering to get some breakfast and then headed back to the campsite to pack up. The last couple of days had taken their toll and I was tired, and it wasn’t even 10 am. 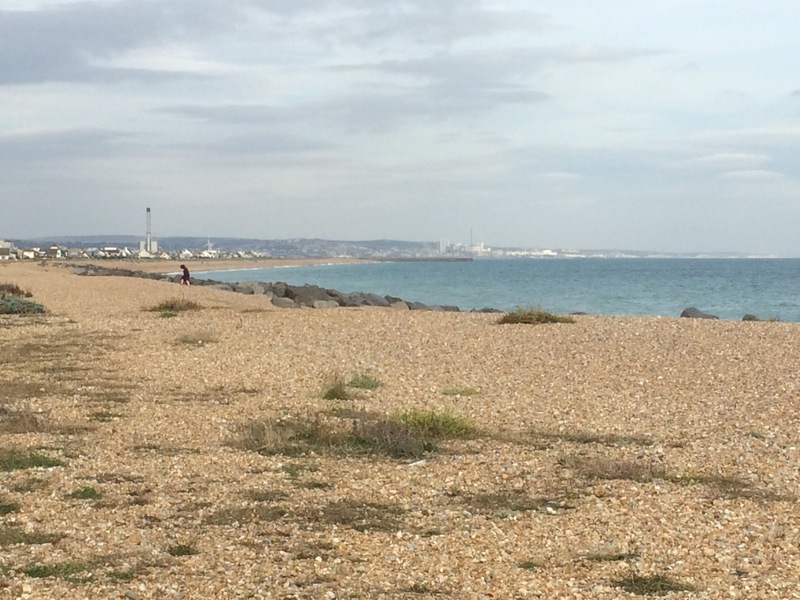 I forced myself to get going and headed inland towards Selsey. 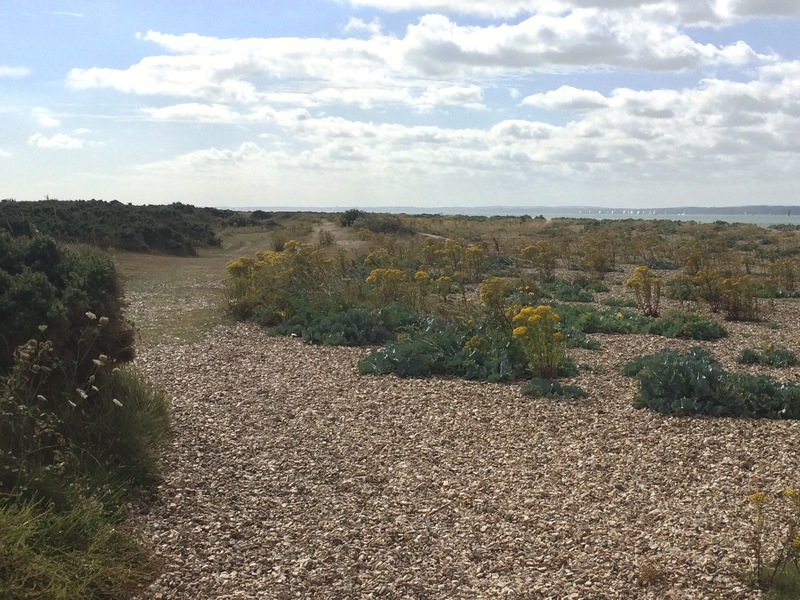 I had been led to believe it wasn’t possible to walk the beach all the way from East Wittering to Selsey Bill so I was forced along farm tracks. It was another glorious day. 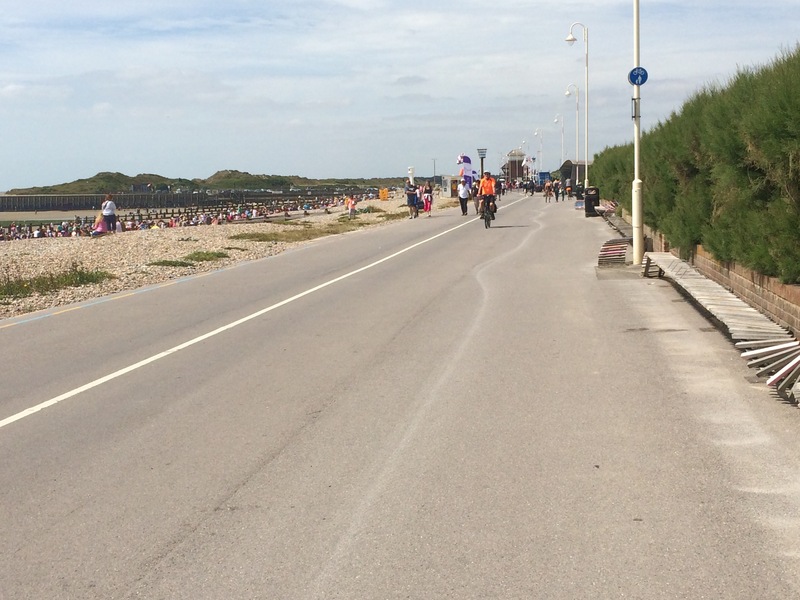 Selsey Bill was strange. 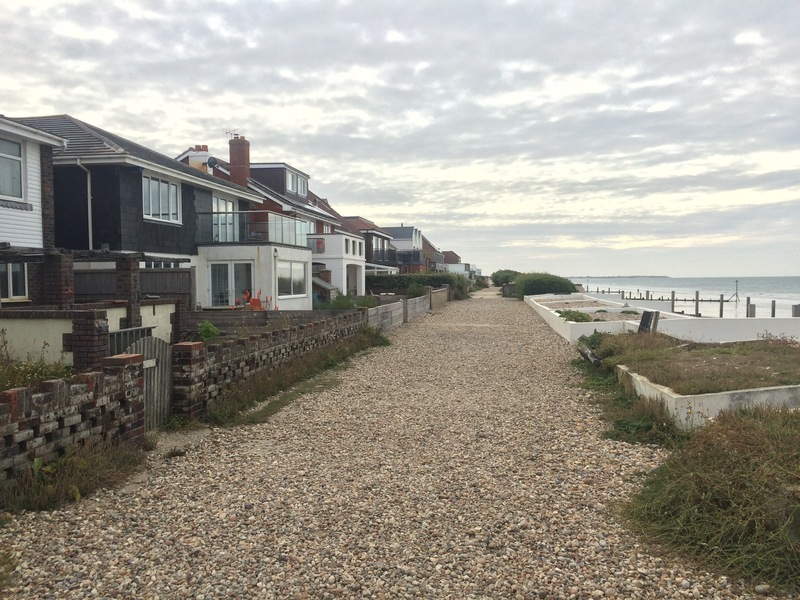 The town was built right up to the shingle beach and so I either had to walk across the shingle (very hard) or weave up and down side roads through the town. I did a combination. Selsey Bill, the point where I waved goodbye to the Isle of Wight and turned North East, was nothing at all. 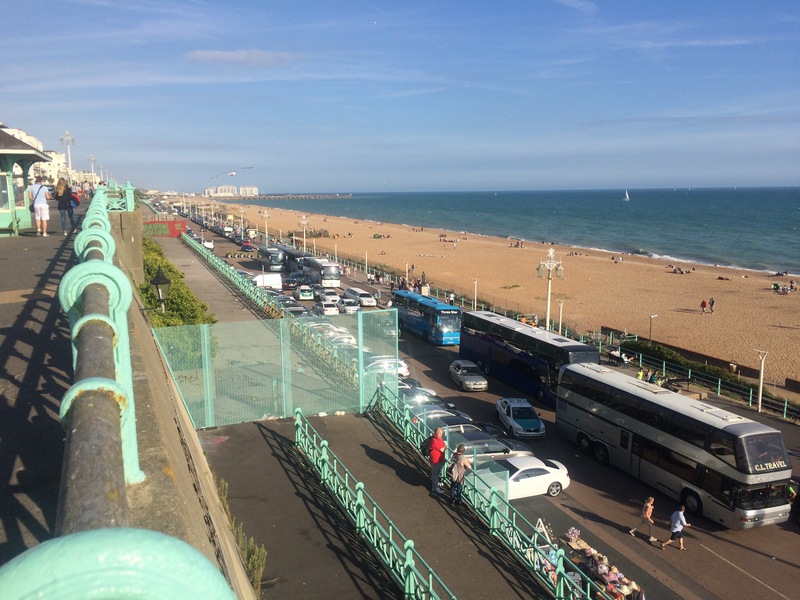 There were houses with big concrete walls that pushed you onto the shingle and that was it. No sign, no nothing. Strange place. 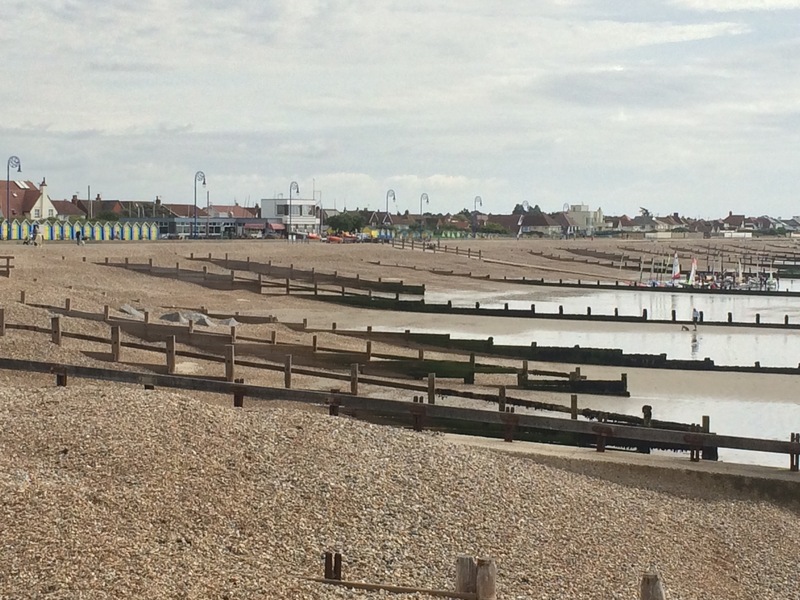 It could be marketed “Selsey: a housing estate by the sea”. I was exhausted. I decided to catch a bus to cut out about 4 miles. 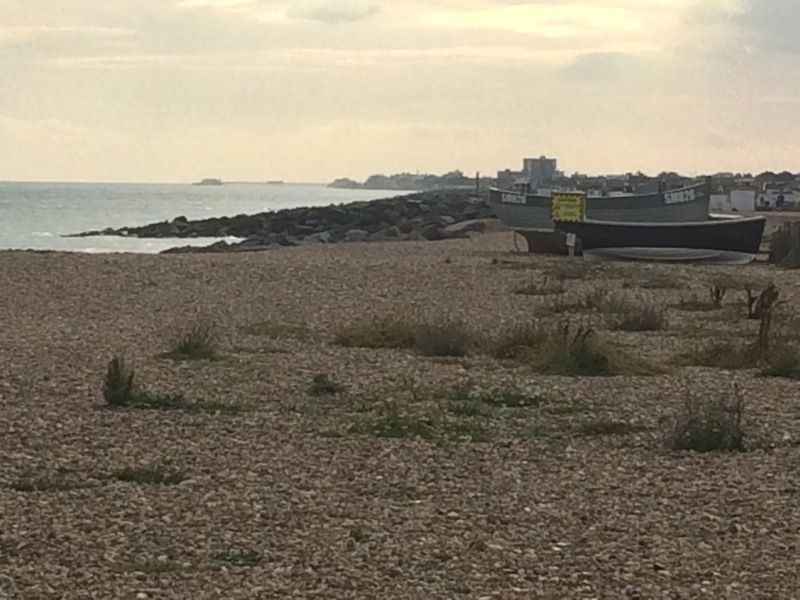 I had to go inland again anyway to get around Pagham Habour. 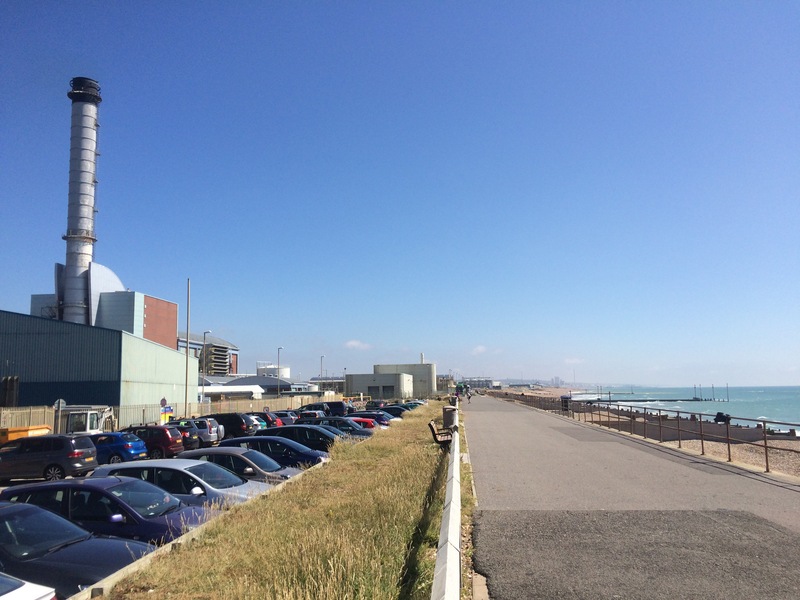 I got off the bus by Pagham Harbour RSPB reserve and an industrial estate. There was a diner here and I went inside. It had only been open a week and Dave promised me the best burger I have had in a long time. It wasn’t, but I didn’t tell him. I ate it because I was hungry and listened to Dave tell me all about his health issues that prevent him from walking far. 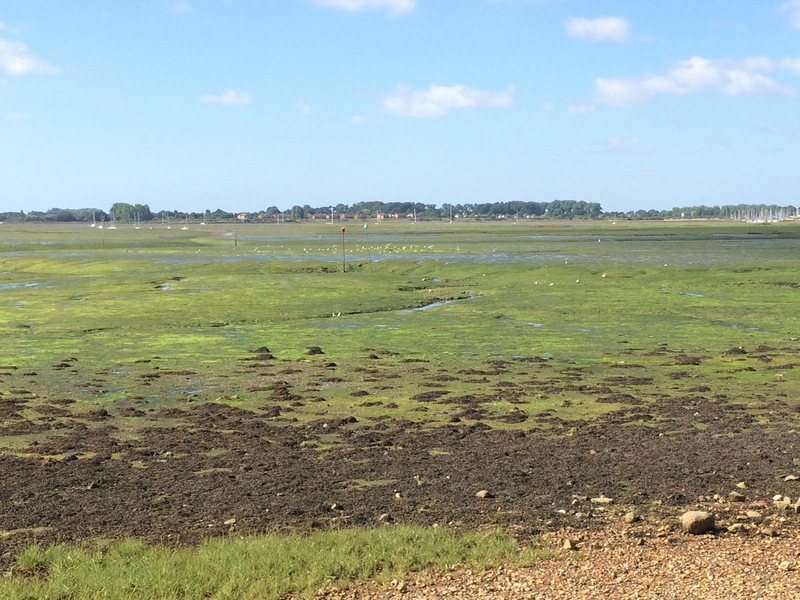 It was a slow, hot, tired walk skirting the edge of Pagham Harbour when the tide was out. I didn’t even see many birds until I got around to a pool on the other side of the harbour. 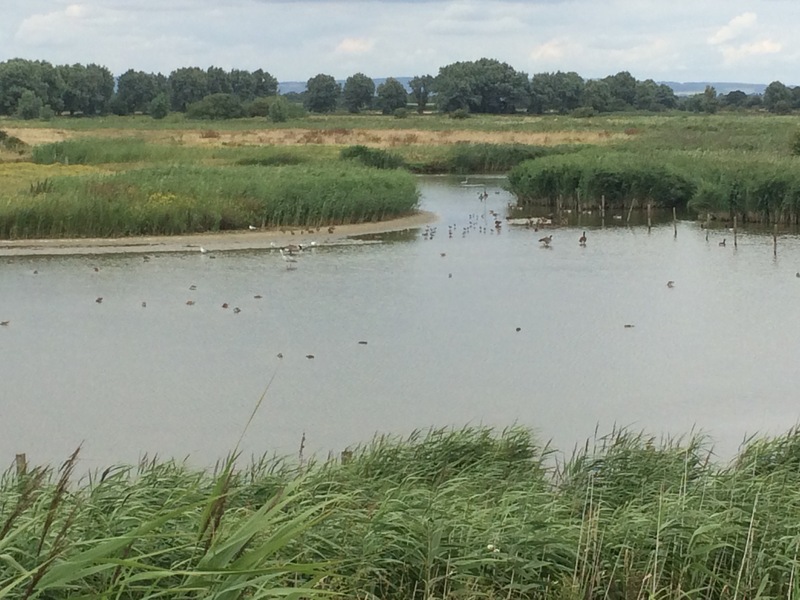 Here there were geese, ducks, plovers, herons, egrets and others. 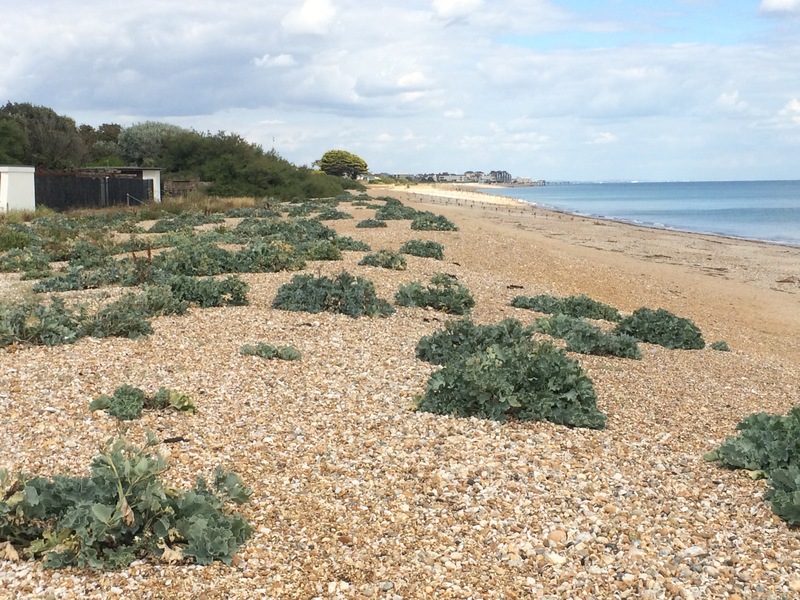 I reached Pagham and took the road through the village to hit the shore again. 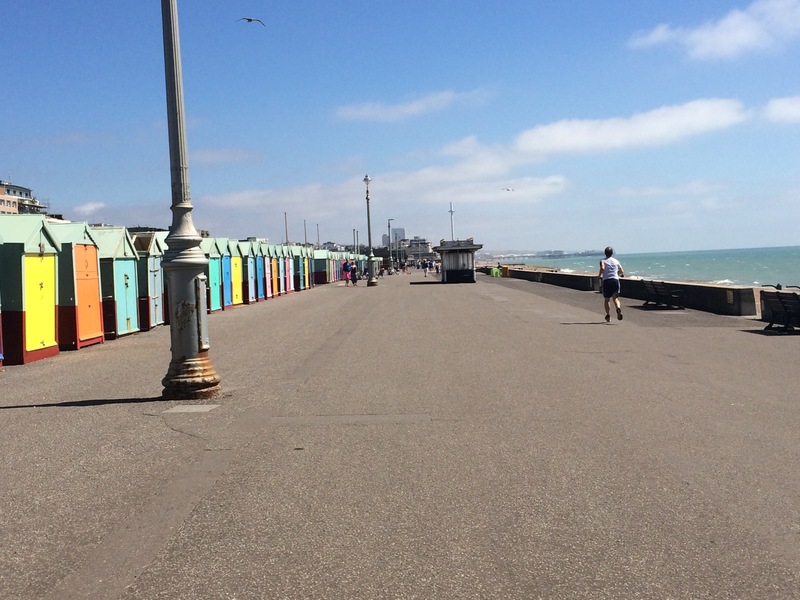 I was on the outskirts of Bognor Regis and it was lovely. 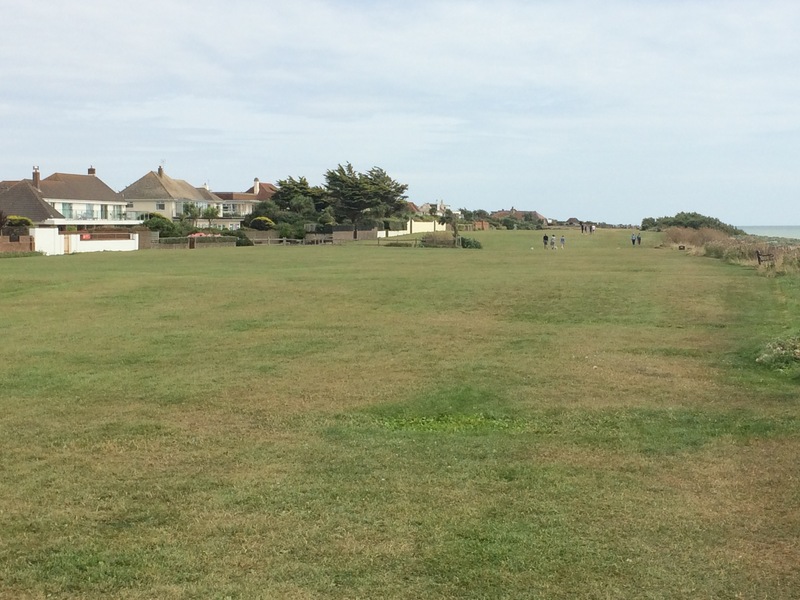 Unfortunately there was no coast path so I swapped and changed between walking along the shingle beach and walking through suburbia. This suburbia was rather plush! The Aldwick Bay private estate was very nice, with lovely big houses set on a quite road just back from the shore. 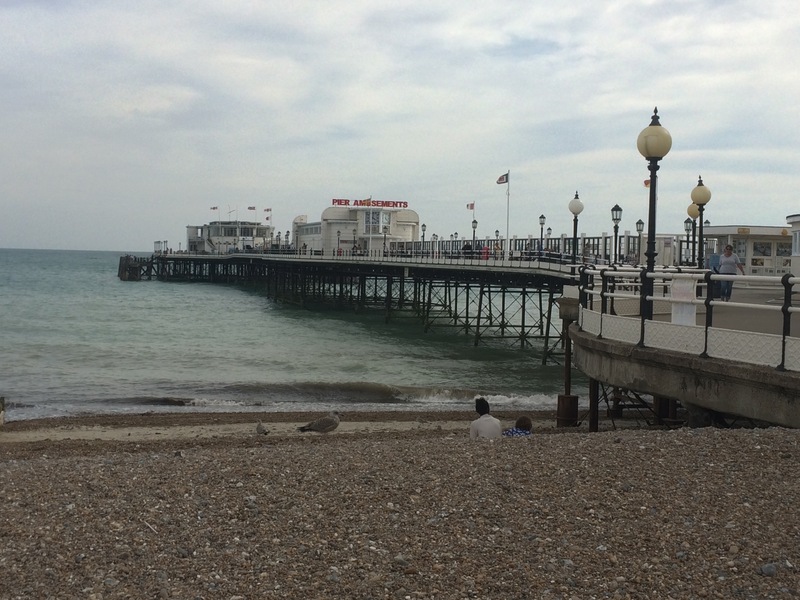 I reached Bognor Regis town and found my B&B. This one had been more reasonably priced and there weren’t any campsites. I bought some food from the local Tesco and collapsed on my bed for the evening. Where should I start on the state of the B&B facilities? I was so angry that I felt I had been ripped off, and so disappointed that I didn’t get the little bit of comfort that I wanted after such a hard day yesterday. The manager wasn’t there and I left without breakfast (that’s how bad it was). I revisited tescos to make myself a baguette instead. I was fuming for a couple of hours. 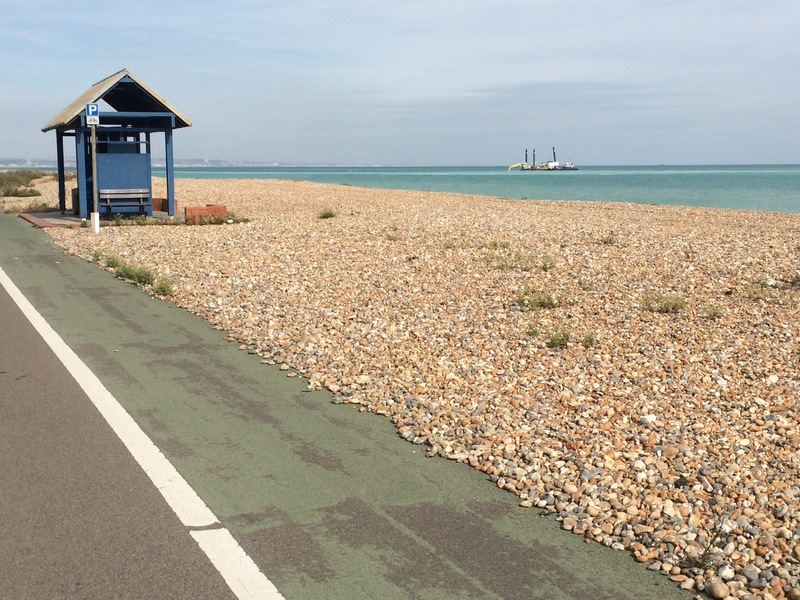 I followed the Hayling Billy Line (a WW2 train track turned into a cycle path) straight up the West side of the island. It was shaping up to be another hot and sunny day. 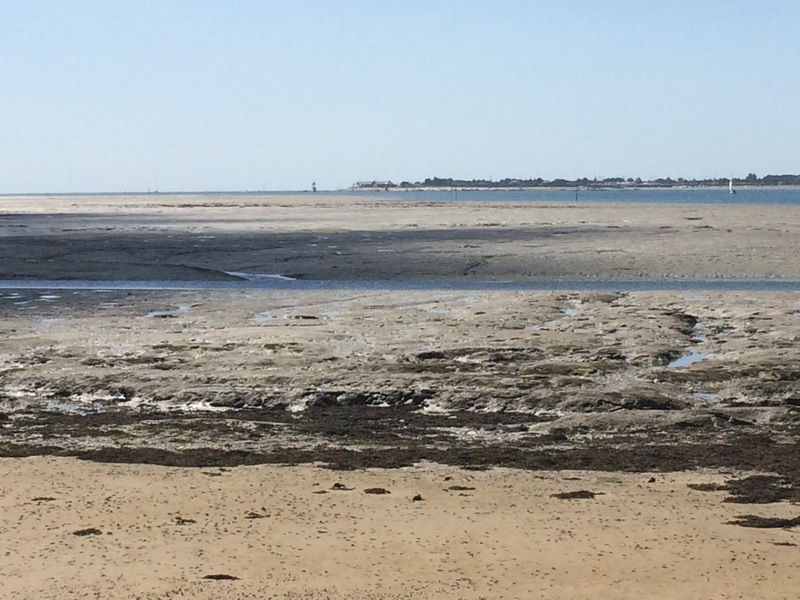 The tide was out and wherever I looked there were mud flats, channels and lots of shoreline. 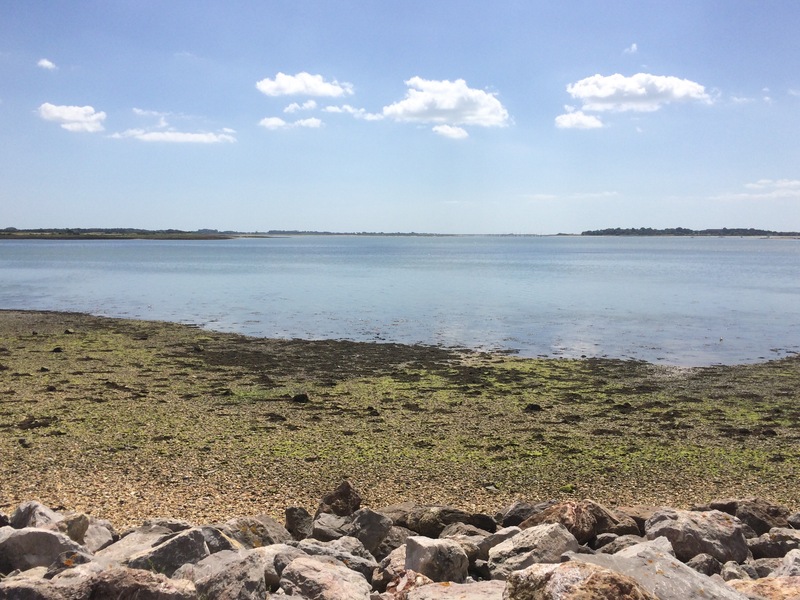 Chichester Harbour is huge and has 2 ‘fingers’ of land poking into it (Hayling Island and Thorney Island), as well as lots of other tiny islands. 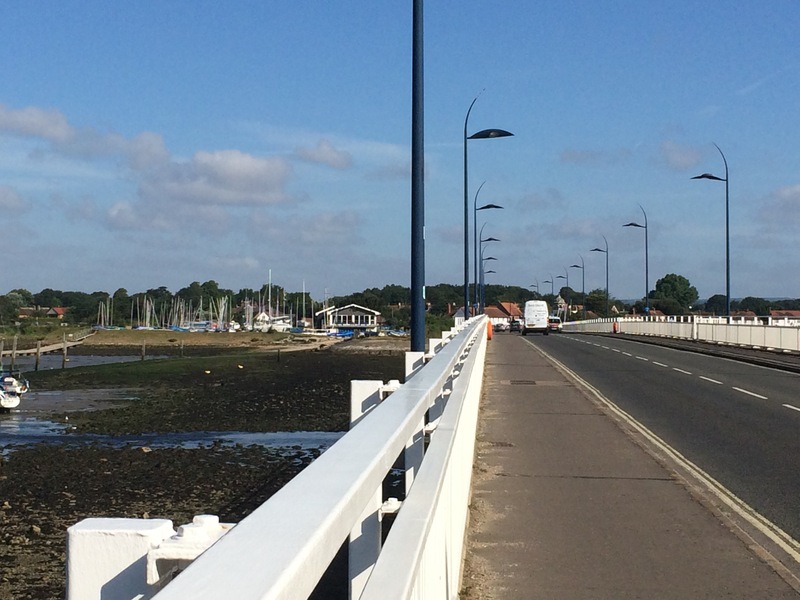 I crossed Langstone Bridge, leaving Hayling Island and following the Wayfarer’s Walk along the shoreline from Havant to Emsworth. 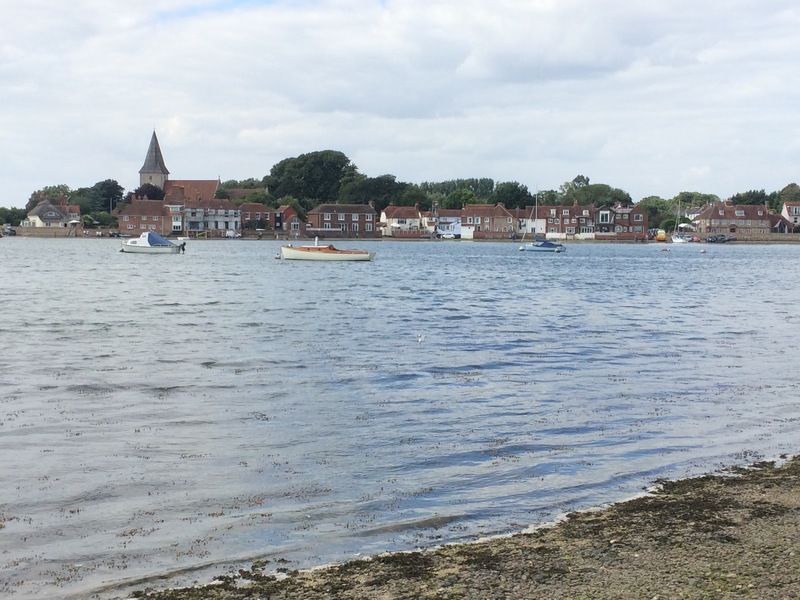 The small town of Emsworth used to have a big oyster trade, selling 100,000 a week to London. The harbour would have been full of Oyster Smacks, the biggest being the 110 ft long Echo. 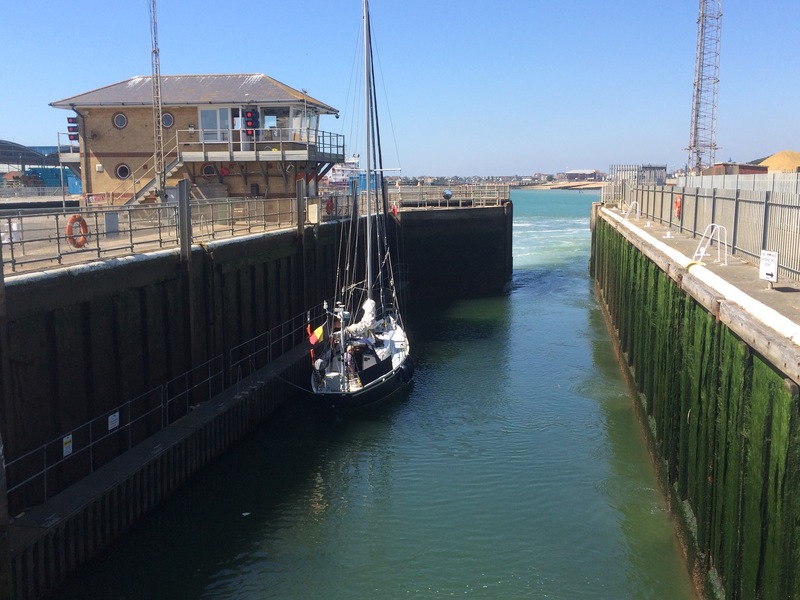 This Emsworth boat was said to be the largest sailing fishing vessel ever built in England. In Emsworth I had a quick cafe stop to get the coffee that I had missed by not having breakfast. I was still angry, and tired, and rehearsing how I was going to get my money back. 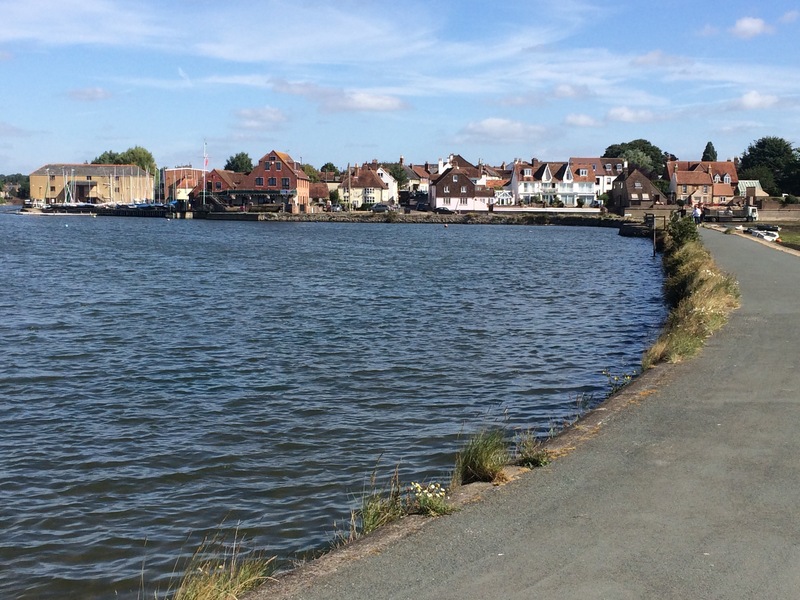 More footpath confusion as I tried to find my way around Emsworth Marina, crossing the River Ems and into West Sussex. It did little to improve my mood! 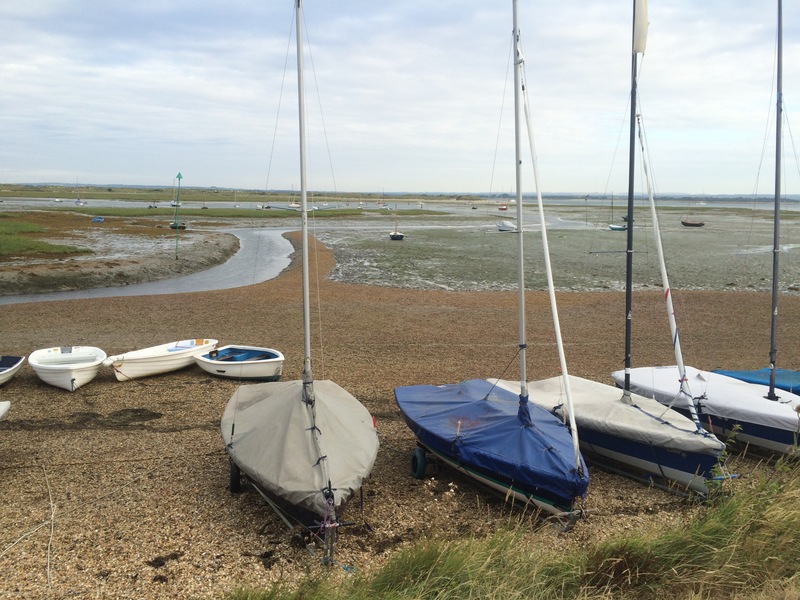 Perhaps a nice walk around Thorney Island would help. 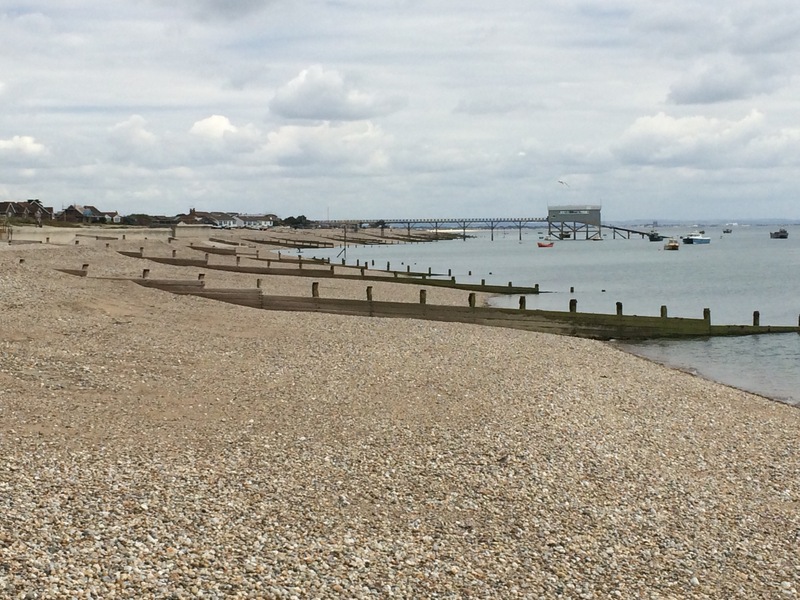 Although now connected to the mainland thanks to seawalls, the Great Deep channel did once cut the Thorney Island off. It is now cut off by big, locked gates as it is MOD land (it used to be an RAF station until 1976). 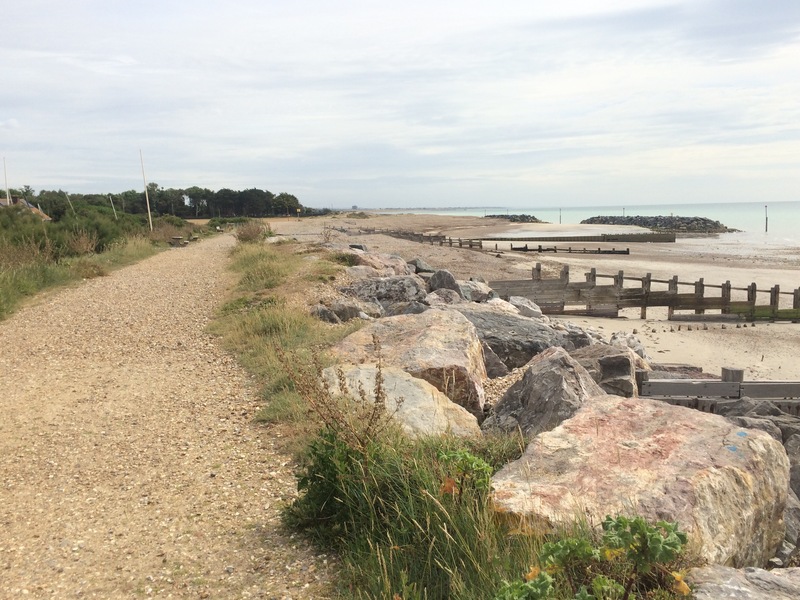 The Sussex Border Path tracks around the edge of Thorney Island for 6 miles and access is granted by buzzing the Guard Room, and the guards remotely unlock the gate. No problem. It was a nice walk and there were a few oystercatchers and boats for me to look at across the harbour. It took me 2 hours to get around to the east access gate, complete with handwritten sign indicating the gate was broken. That couldn’t be right. I pressed the buzzer and was told the gate was broken, as per the sign, and I would have to go back the way I had come. This was red rag to a bull. The steam coming out of my ears was probably visible for miles as I blew my stack. Why wasn’t there a sign on the other gate? Why hadn’t they told me this gate was broken when they let me through the other gate? What was wrong with the gate? Were they really telling me I had another 6 mile, 2 hour walk back around Thorney Island to get back to where I started? Who was their commanding Officer? I wanted him to come and explain this to me ASAP and I wanted a car to drive me back around (not possible I know). I had almost reached the point of resuming my military rank and they had put me on hold while they fetched someone of superior rank who would come and see me. Suddenly I heard a buzzer sound and so pushed the gate. It opened. Not so broken after all! Had I not been so stressed and so tired with so far still to go I would have taken them to task on this as it was shocking behaviour. 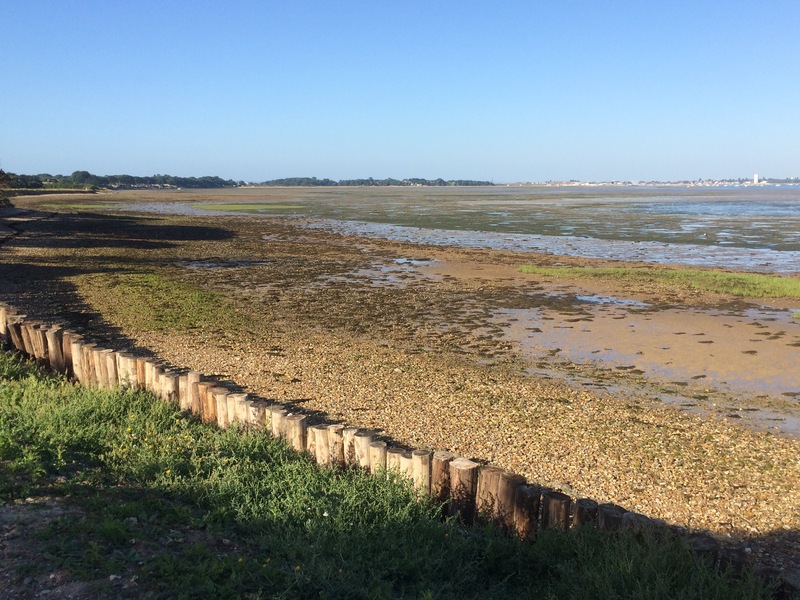 I carried on skirting around Chichester Harbour. 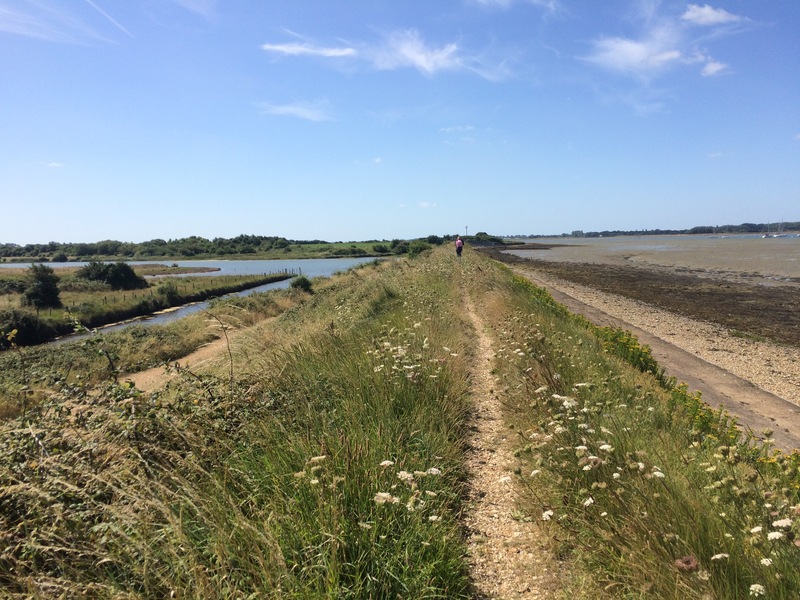 I decided not to bother walking around the next ‘finger’ of land at Chidham and just followed the A259 straight along to the final ‘finger’ at Bosham. 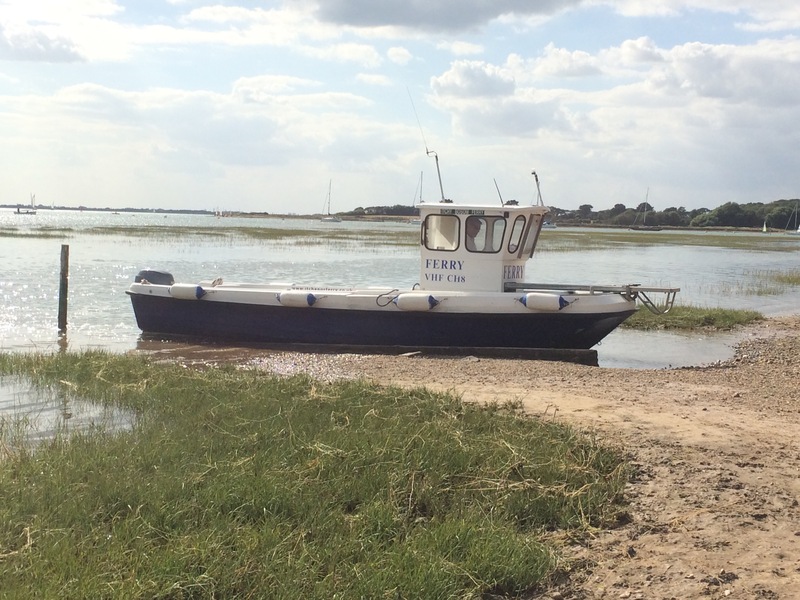 This one had a ferry across the Chichester Channel to West Itchenor so I avoided having to walk back inland to Chichester and around. 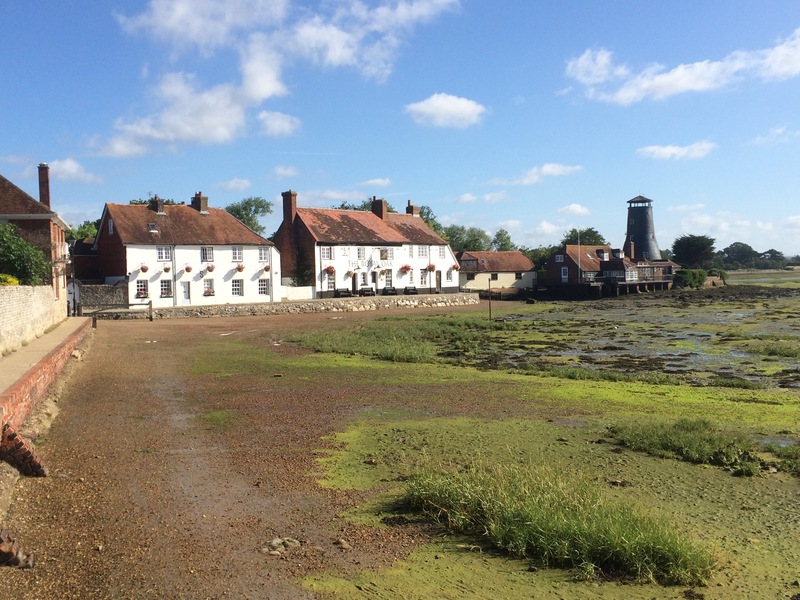 Bosham was a very well-kept and smart little town. The houses looked lovely. I stopped at a cafe for some lunch and a break from the hot sun. It was also time to phone the West Town Inn and ask for a refund. I was calm and reasoned and Marcus was very nice about it, apologised and offered to refund me in full (even though I was prepared to pay half what I was charged as a fair fee for the service received). A small win. 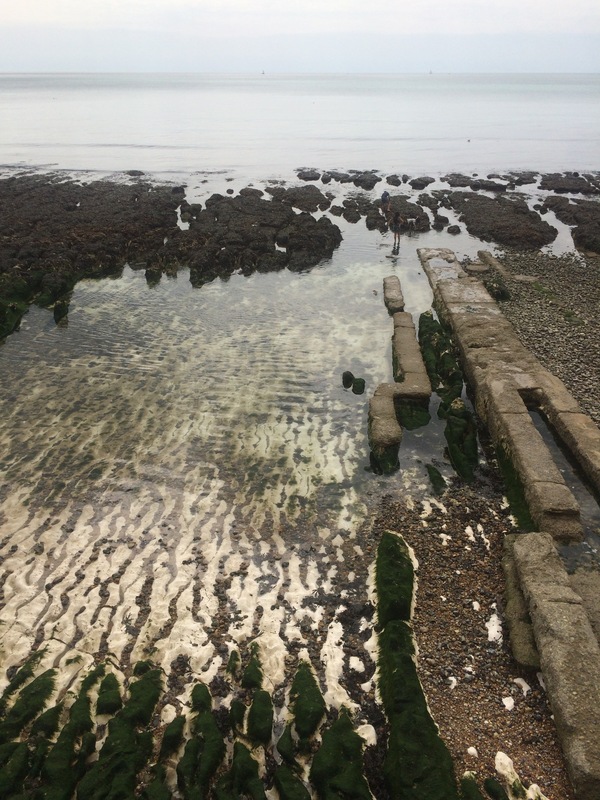 I caught the small, seasonal ferry and walked through West Itchenor. 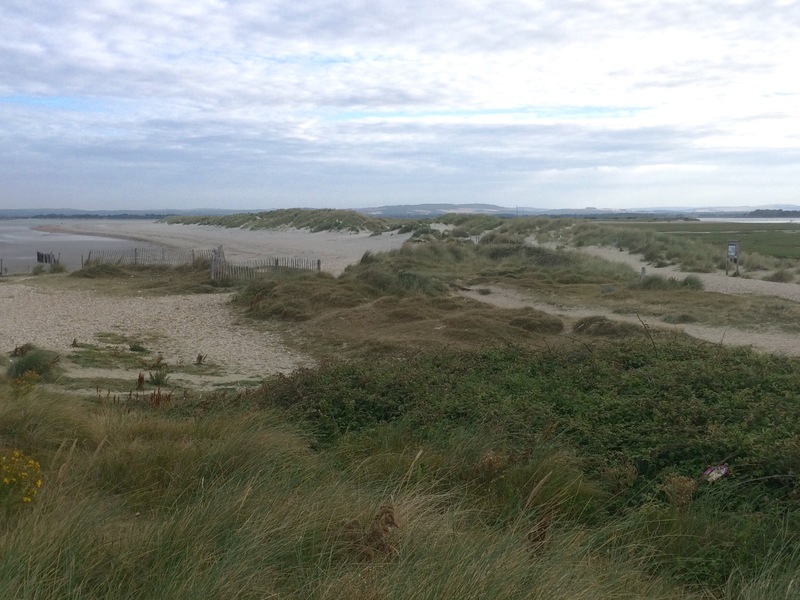 I was headed for the Witterings and there were plenty of campsites so I thought I’d be fine. Mistake. The first 2 I phoned didn’t have room, not even for a hiker with a small tent – they didn’t even think about it, just a flat ‘no’. The 3rd campsite wanted £25 and the 4th, £16. 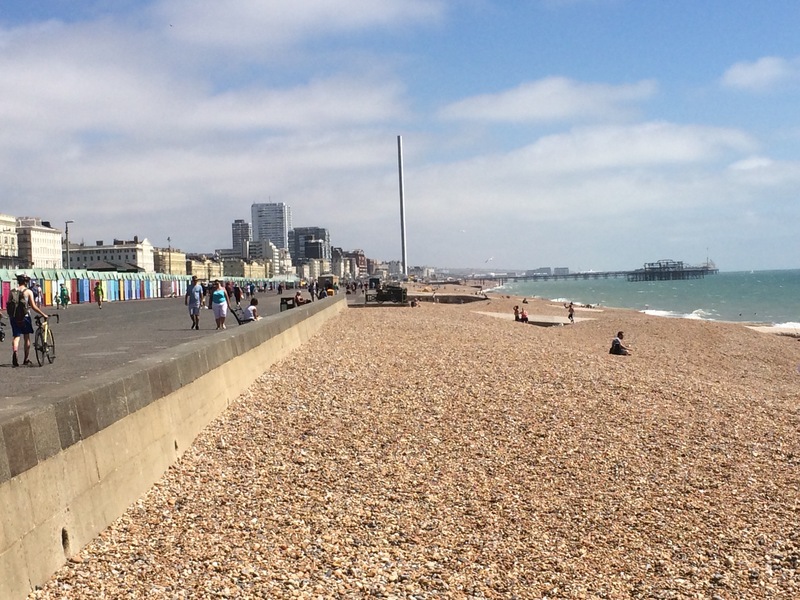 By now my search was getting too far away so I resolved that I just had to pay the £16 and acknowledge that this section of South Coast is just very expensive. It was a longer walk to the campsite than I wanted and I headed straight there along the roads. Fortunately the site was quite nice and it was an easy walk along a track to East Witteribg for some dinner. After a pretty stressful day I was pleased to find a nice Italian restaurant with wifi, a plug socket and wine. On reflection, I had managed to get winning outcomes to my frustrations today. I had shouted at the military and reasoned with the civilians. I am adding adaptable and tenacious to my CV. 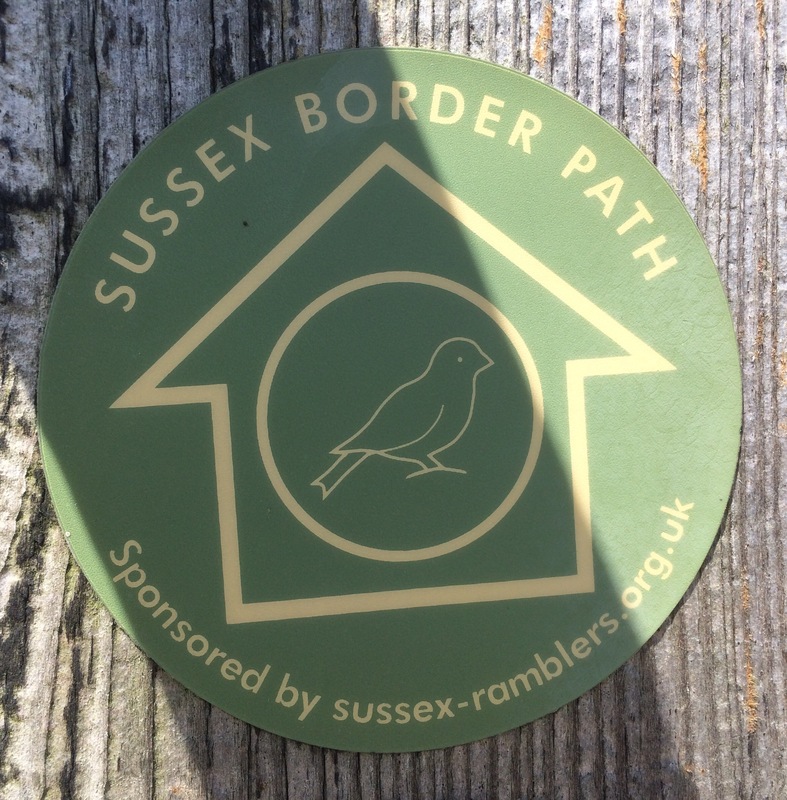 I made it into Sussex; unfortunately it only has a border path and not a coastal path! I was up and away in time to catch the first pink ferry across the River Hamble at 9 am. I was too early for cafes so made a brief stop at co-op for a bit of breakfast. 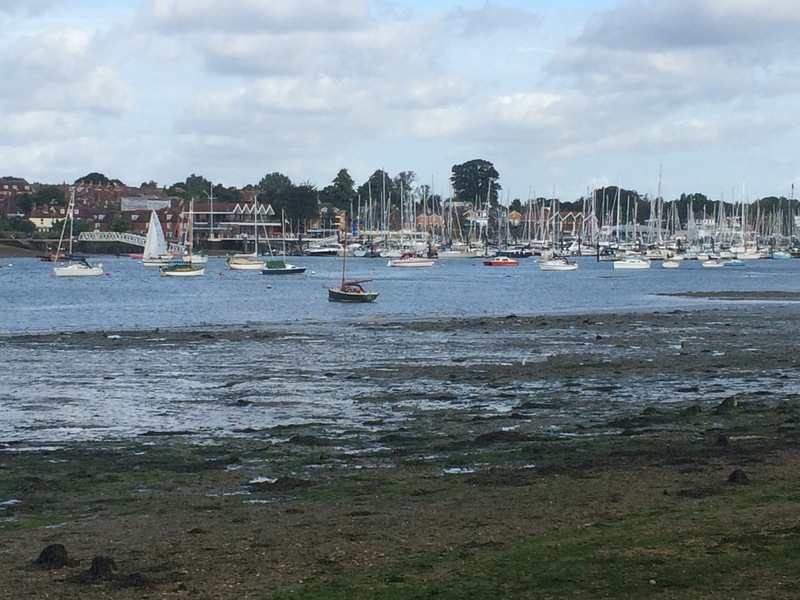 looking back across the river at Hamble, just visible through all the boats! Hamble was chocolate-box pretty and I saw lots of expensive cars in driveways. I didn’t know that the RAF has its yacht club base here; if I had I might have joined! 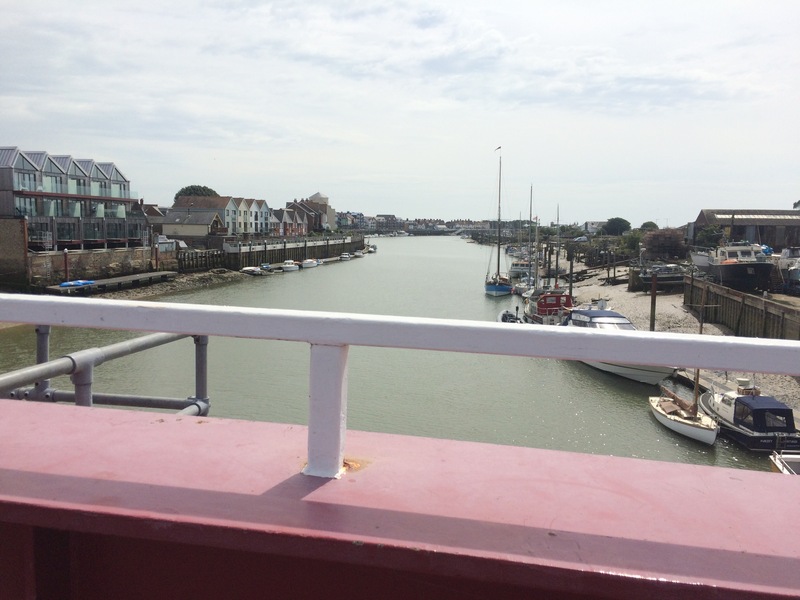 how to find the ferry amongst so many boats – paint it pink! 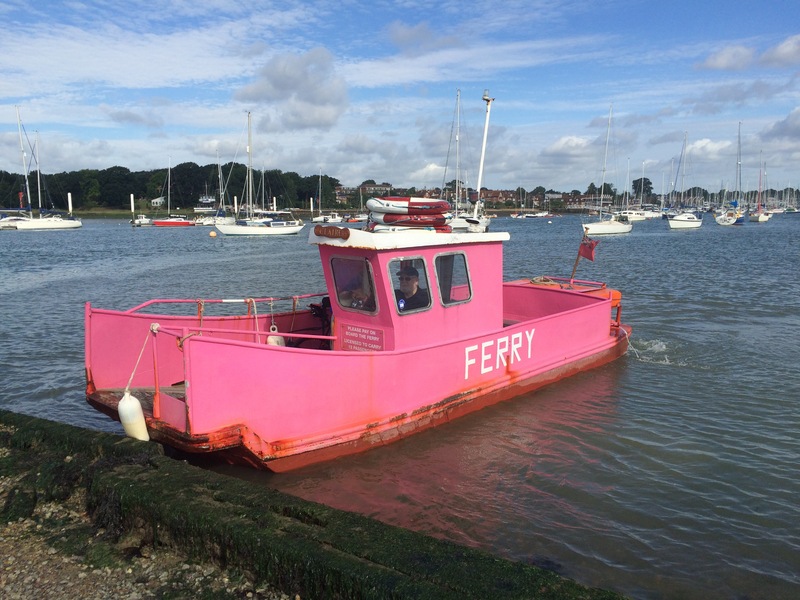 The pink ferry navigated its way through the hundreds of moored boats and dropped me at Warsash. I walked up to the main street and found somewhere to get a coffee. Chatting to the lady in there I discovered that Hamble was considered the more pretentious, boaty town than Warsash, but these Hamble Valley neighbours do get on. 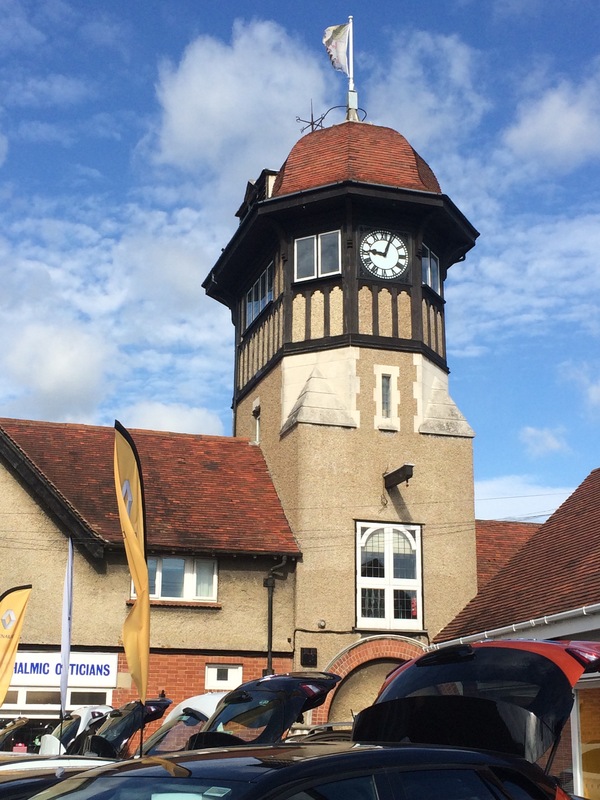 Warsash has a world-renowned maritime academy. 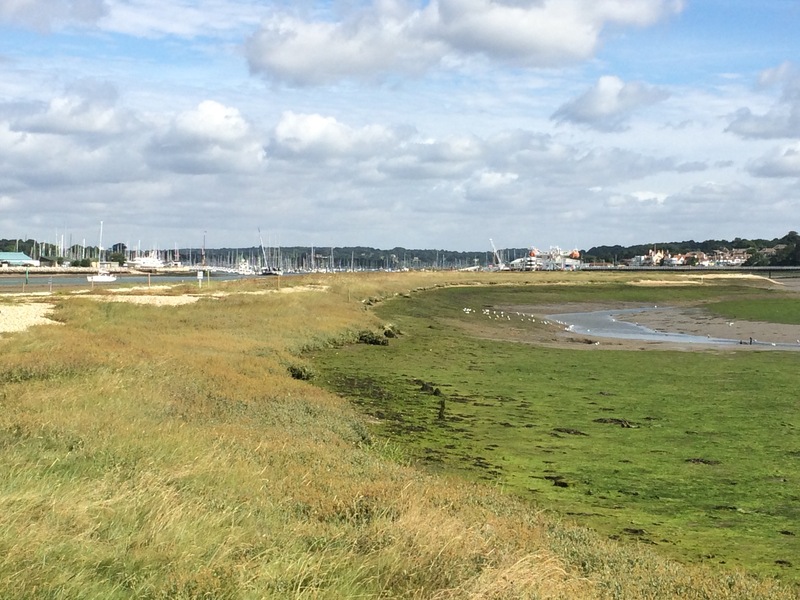 The sun was shining as I made my way past Warsash’s old strawberry fields (strawberries are no longer grown here), around the edge of the River Hamble and back onto the banks of Southampton Water. 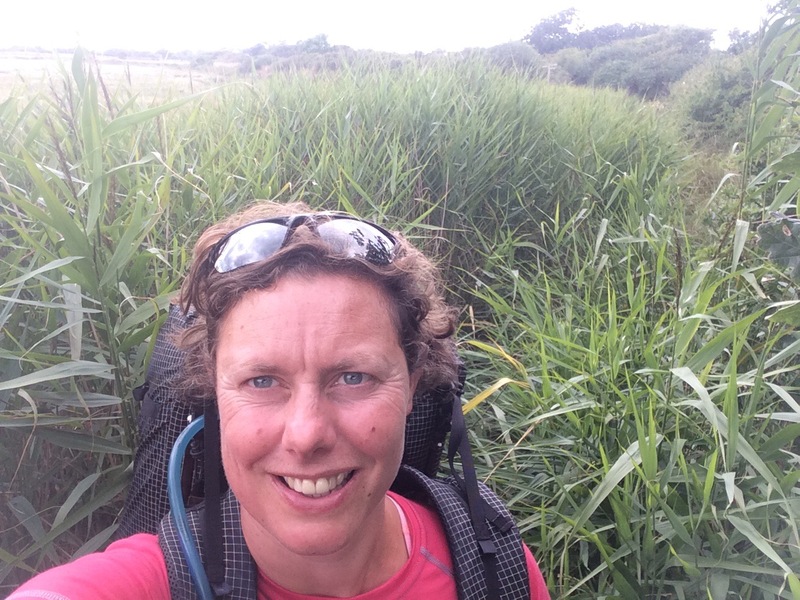 I was following The Solent Way, which seems to be Hampshire’s coastal path. Unfortunately it is very badly signed and I had to backtrack a few times today as it was at times difficult to discern the route on the map and there were very few signs to help me out. 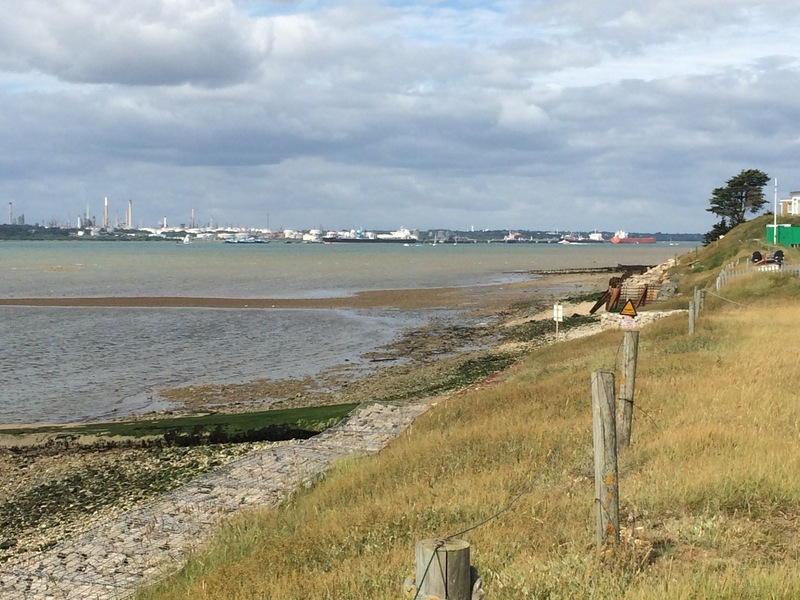 There was a lot of open ground, a mixture of grass, mud and shingle, along the edge of Southampton Water. The path ended up on a small cliff top and there was significant erosion that had closed a section of the Chilling Coast. What a shame no one bothered to put any diversion signs up. Fortunately some holiday home owners gave me directions. 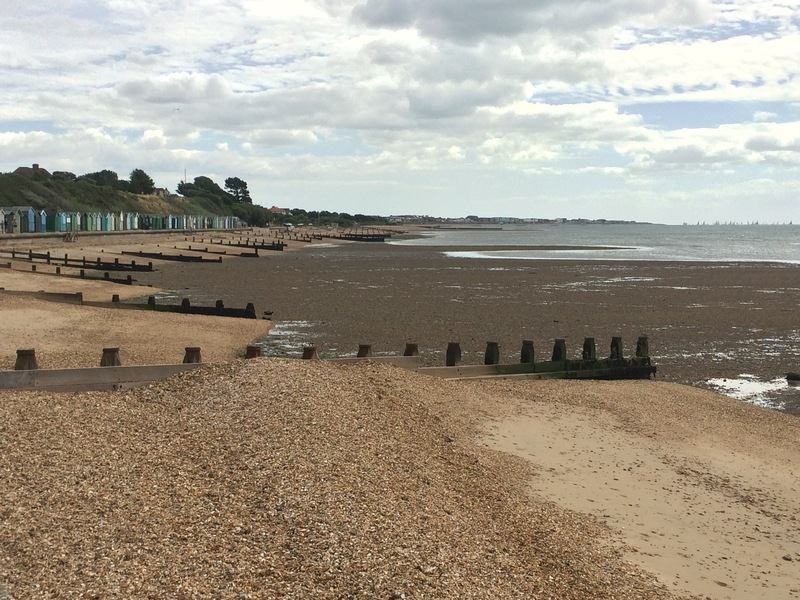 I reached Lee-on-the-Solent and had a promenade to walk along, past the old Naval airfield where I once spent a University Air Squadron summer camp. 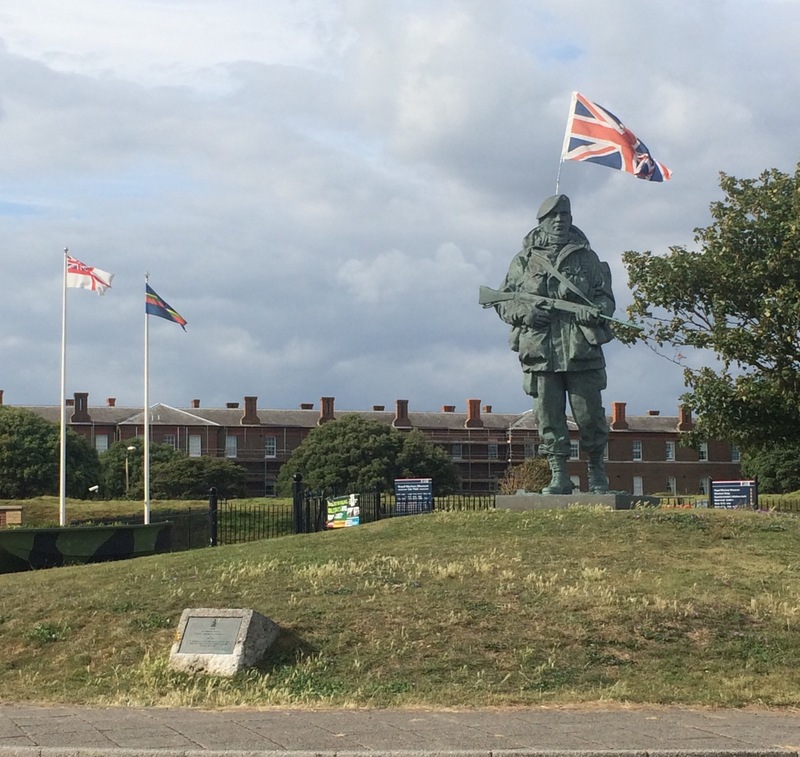 I had reached Gosport and I passed The Diving Museum, next to Browndown Army Camp and kept going, around Stokes Bay, to Gilkicker Point. 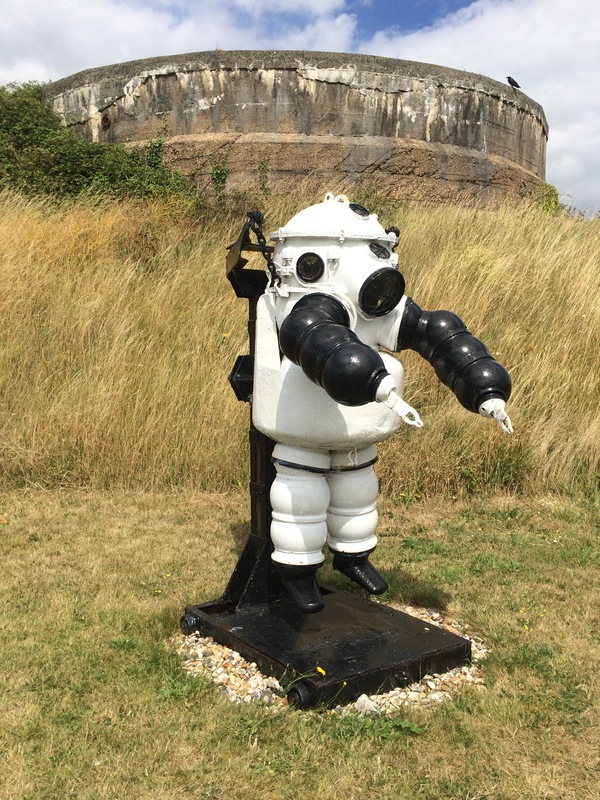 Neufeldt and Kuhnke’s 1939 design atmospheric diving suit; unfortunately the joints leaked! 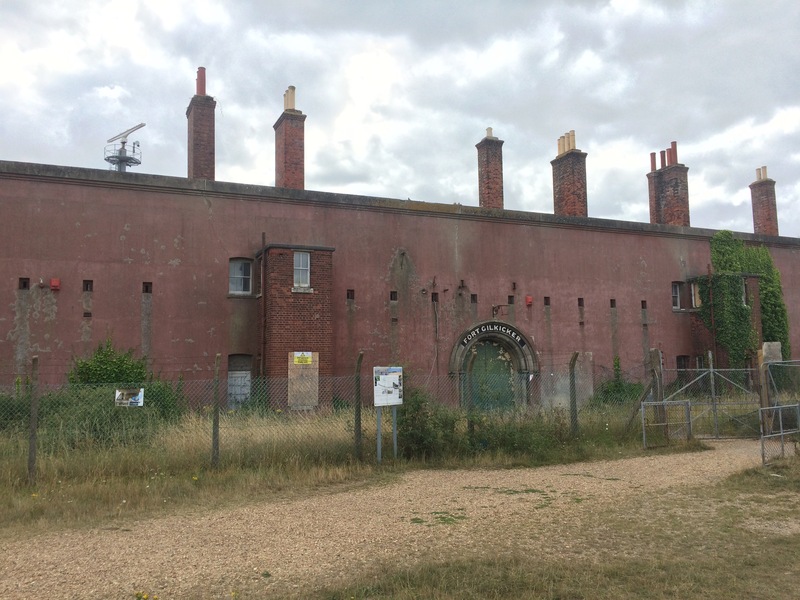 The 1860 Grade II* listed Palmerston Fort at Gilkicker Point was boarded up and fenced off; not that this seemed to bother the kids who were scaling its roof. 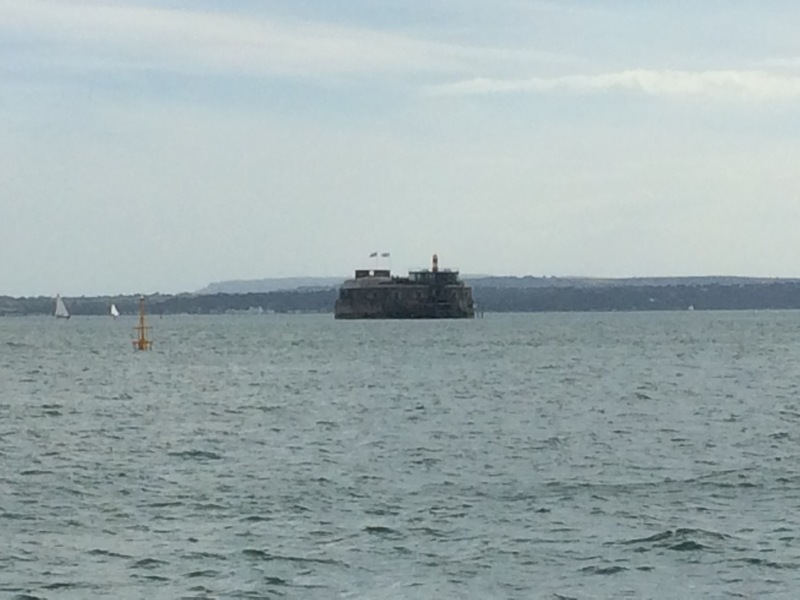 It did look in a sorry state and certainly no longer capable of defending the entrance to Portsmouth Harbour. 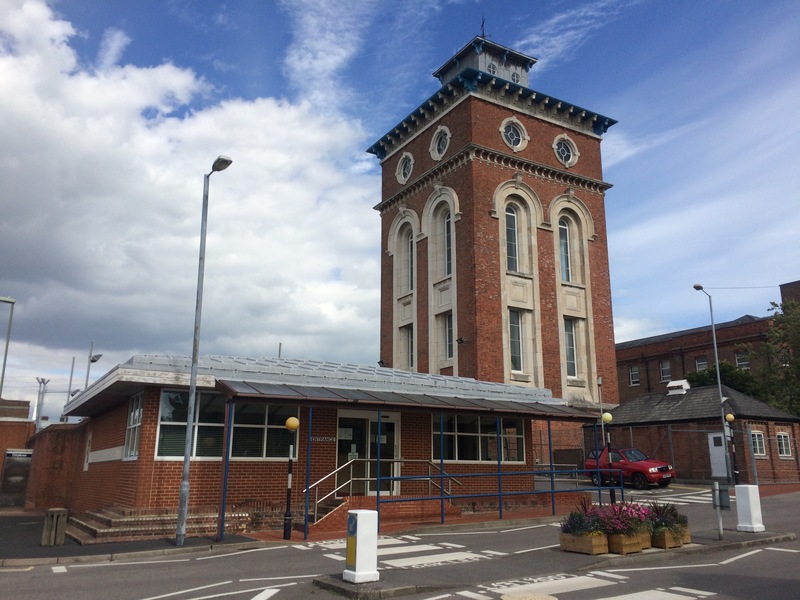 To get to the narrow harbour entrance I had to pass HMP Haslar, now an immigration detention centre, and the old Haslar Military Hospital. The hospital had been turned into luxury apartments. 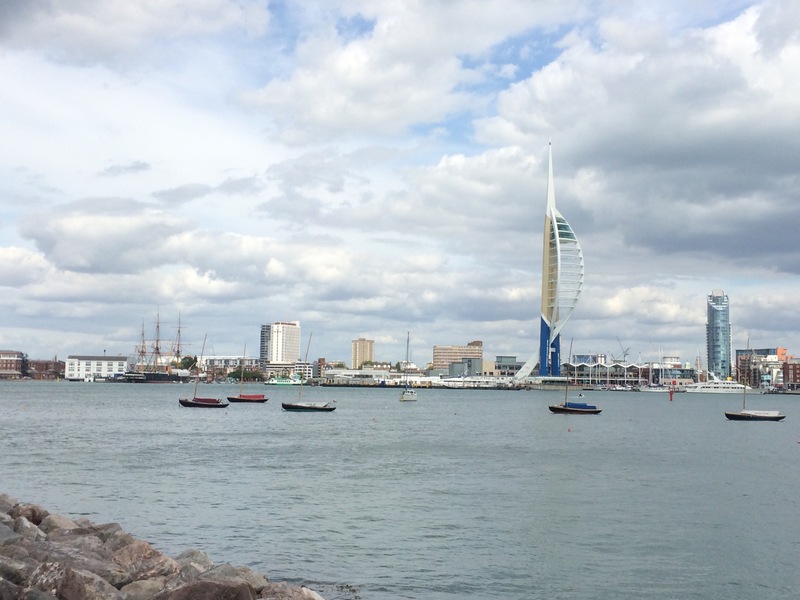 Portsmouth waterfront looked impressive, particularly Spinnaker Tower. 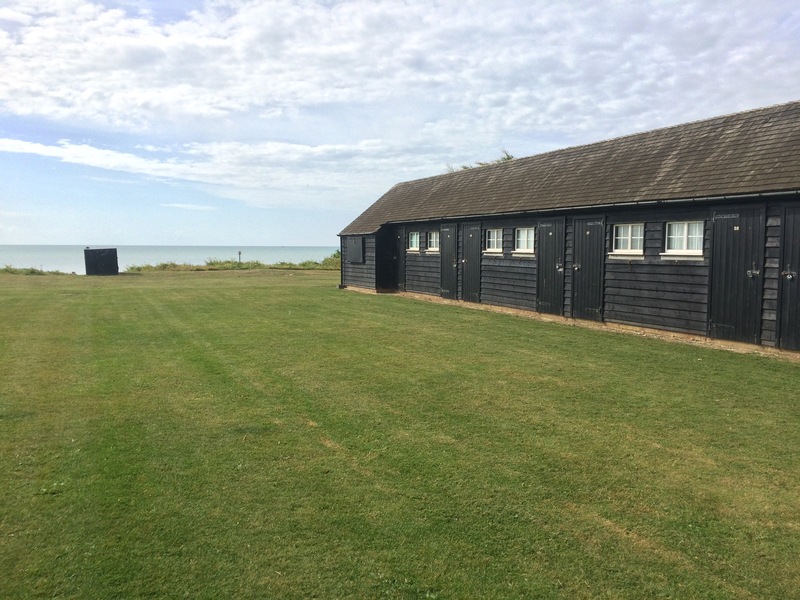 I also picked out the BAR team shed but no sign of the America’s Cup yacht. 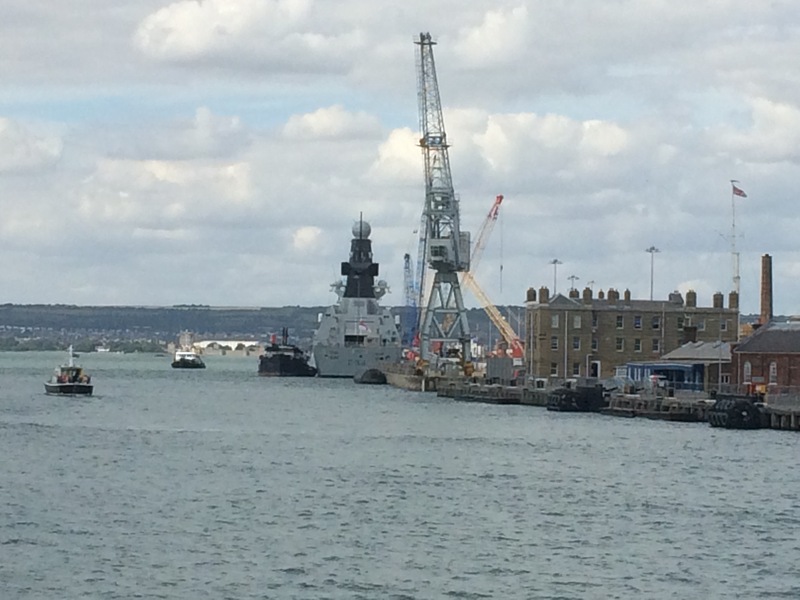 There was an interesting contrast of the old Naval warships berthed alongside the new. 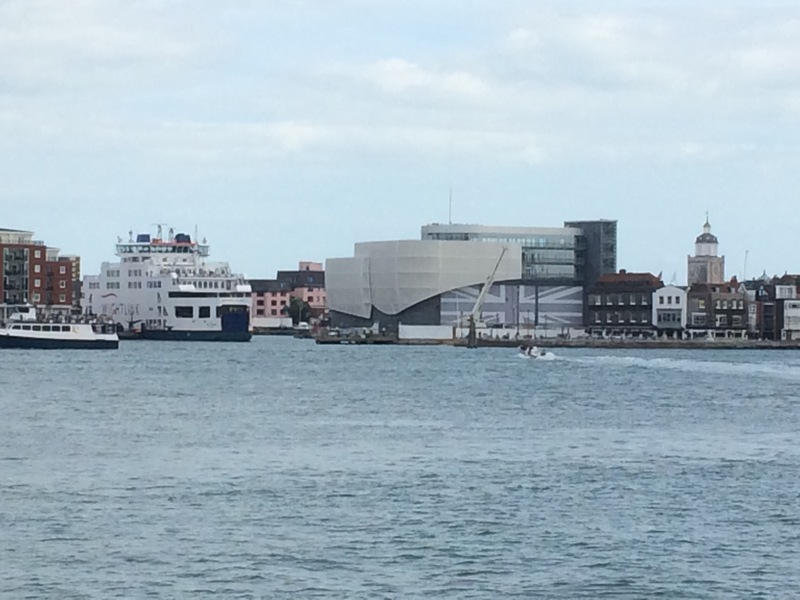 I walked straight onto the Gosport Ferry, which reminded me a bit of the Mersey Ferry; it was a big boat and a slick operation. They don’t sell single tickets so I need to go back sometime. 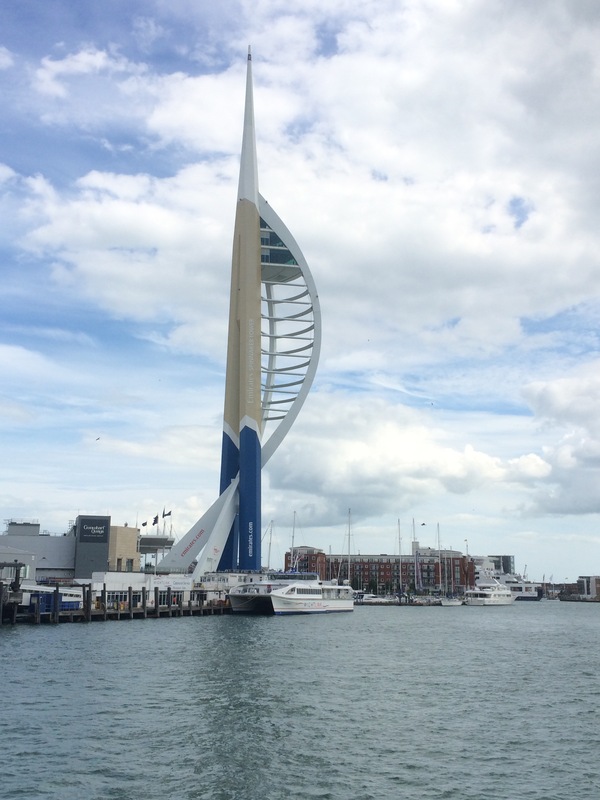 I have been to Portsmouth many times, but never to the old part. 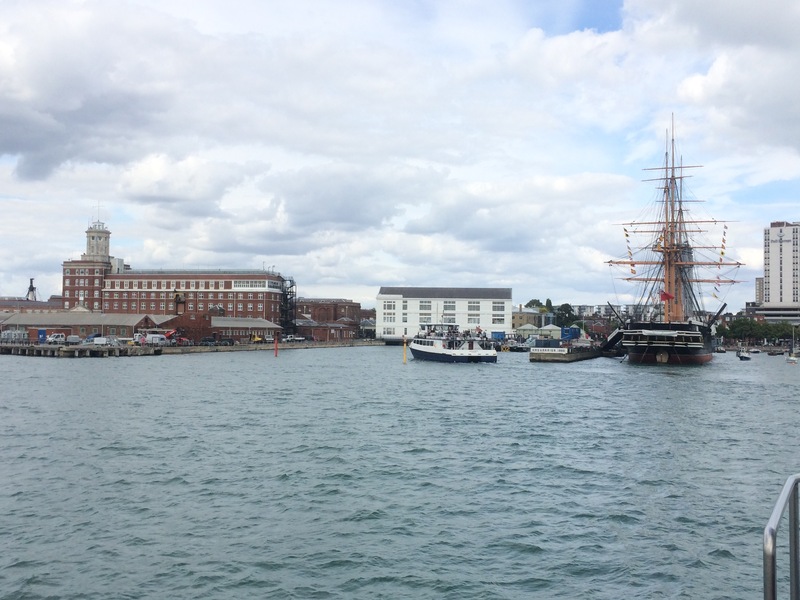 Once out of Gunwharf Quays, the busy, updated shopping precinct, I found myself in Old Portsmouth. 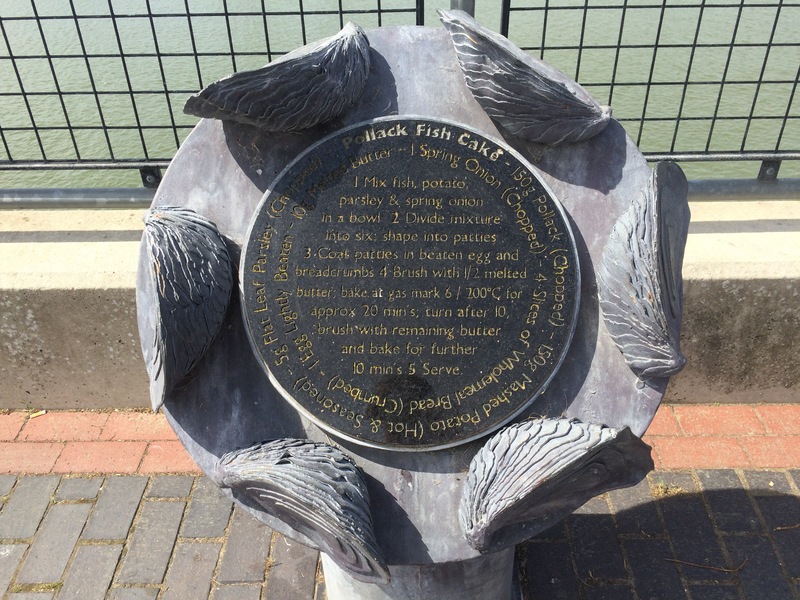 Just like Plymouth, there were lots of memorials and commemorations of various sailings from the historic docks. I could have spent a day here looking around. 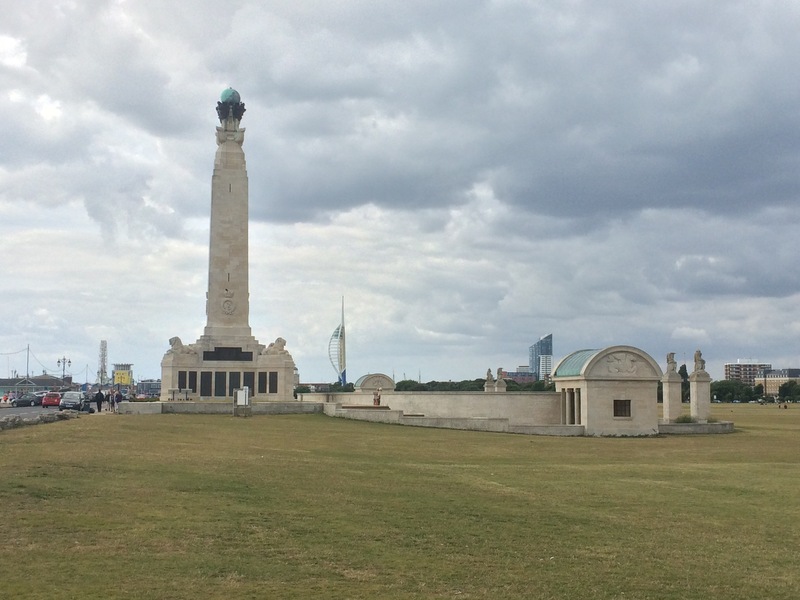 Instead I walked along the Millenium promenade, past Southsea Common and all of its memorials (including the main Naval one that is the equivalent of the one in Plymouth), to Southsea Castle. 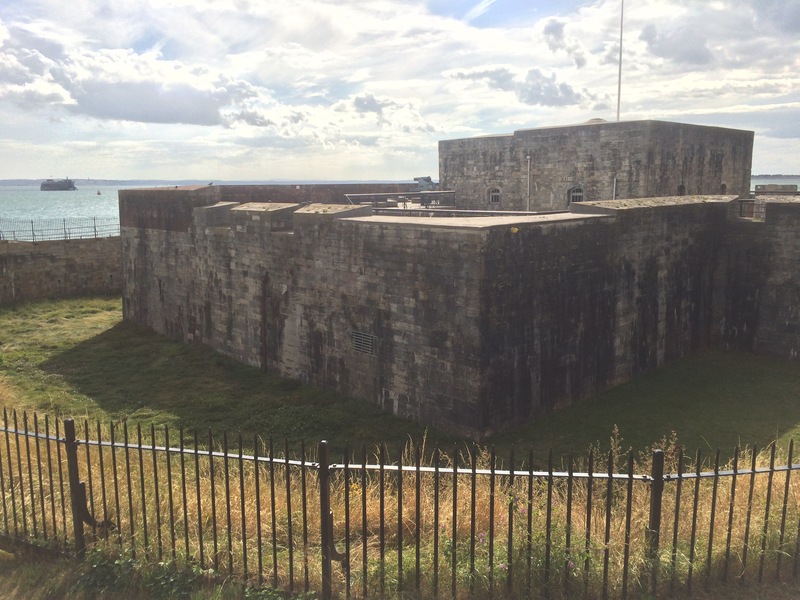 This castle complements Gilkicker Fort on the other side of the harbour entrance. 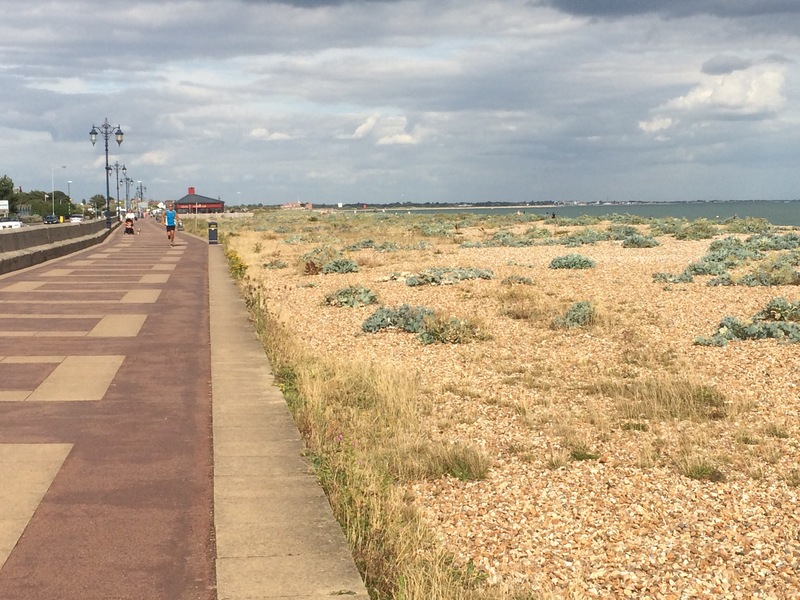 The path followed the long beach, past South Parade Pier, past the Royal Marines Museum, and all the way to the entrance to Langstone Harbour. 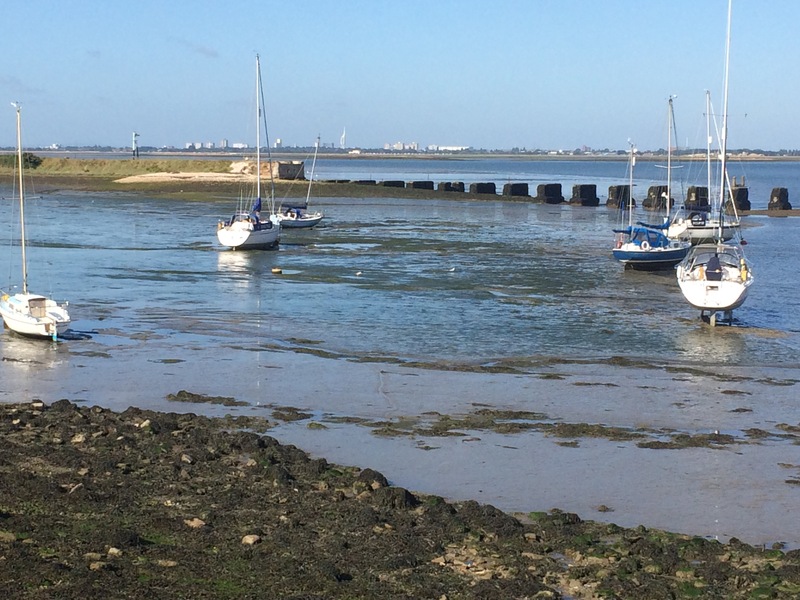 I had decided not to walk up the the East side of Portsea Island (the island that Portsmouth inhabits) but instead to get the ferry across the mouth of Langstone Harbour to Hayling Island. 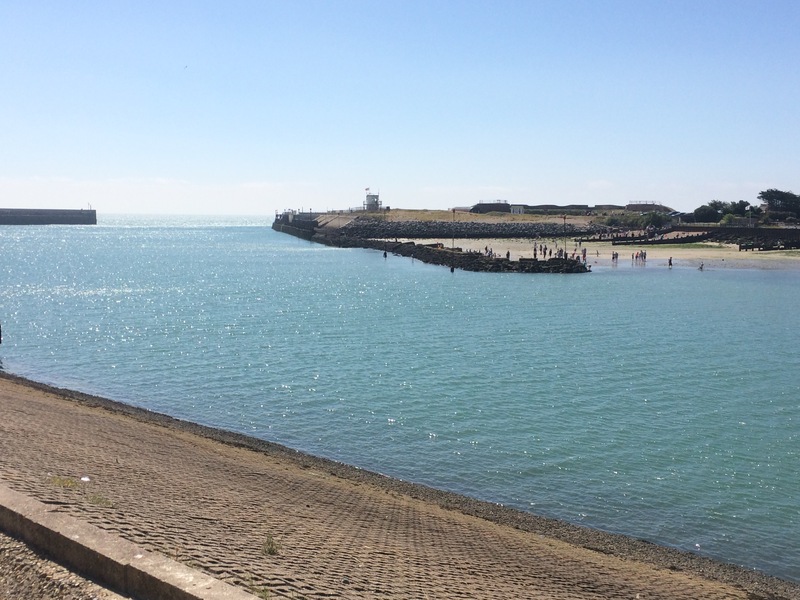 Both Portsea Island and Hayling Island are a bit bell-shaped so they present a long south coast to the sea and then the harbours of Portsmouth and Langstone open up considerably after a narrow entrance. 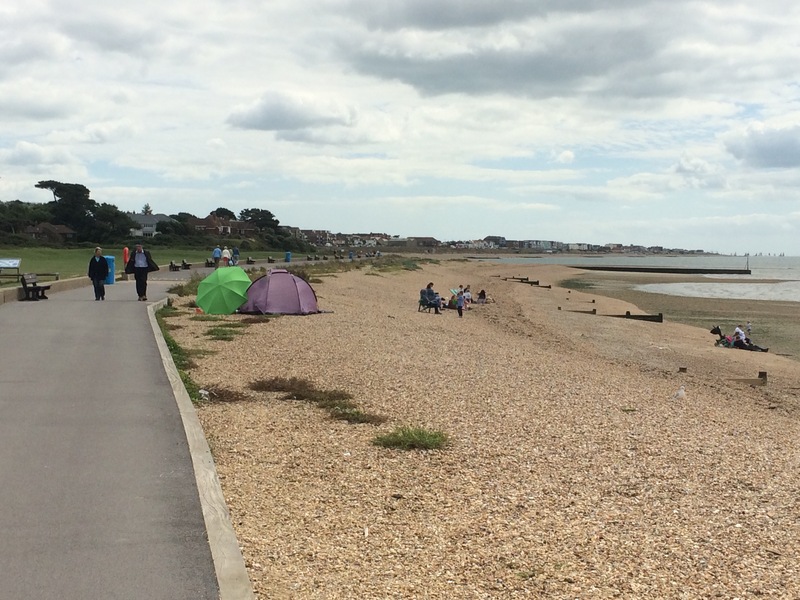 On my way to the Hayling Ferry (which only re-opened a few days ago after a couple of years with no operator) I passed a campsite. I was tired and there was a bar so I changed my mind and went in to see if I could stay. After waiting 15 minutes to speak to someone at reception I was told there was room for me…at a cost of £30. I left. 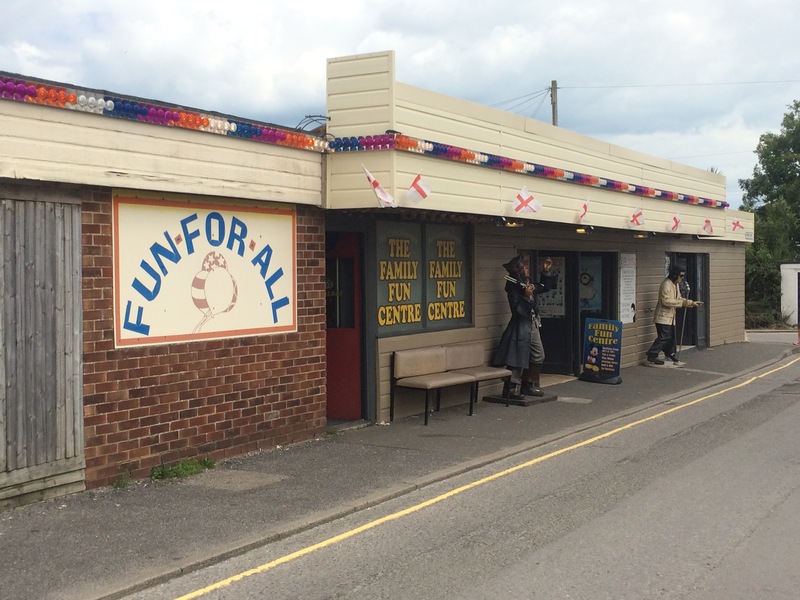 It was another one of those holiday parks. I had to rush to catch the ferry after that as they only ran every 40 minutes and I didn’t want to miss the 5.40 pm crossing. I just about made it and walked straight on…and then straight off the other side. I was so preoccupied with wondering where I was going to stay that I didn’t notice I hadn’t paid. I asked some cyclists and they said that, just like the Gosport Ferry, this one only sold return tickets so the operators must have assumed I was on my return journey. No wonder they went out of business for a while! It was almost 6 pm and I had nowhere to stay. I was very tired and wanted some luxury so I phoned a guest house in West Town and splashed out. It seemed every type of accommodation, from campsites upwards, had suddenly jumped up in price. As I was about to find out, that did not reflect a jump in quality or standards. The bed was clean and there was a Tesco nearby so I was alright for the night. However; there were people screaming at one another in the street from midnight for an hour and the accommodation was awful: window blinds that wouldn’t open and fell down, dirty floor, no hand soap, and the list went on. I was unhappy at being ripped off and more would follow in the morning. A disappointing end to a long and interesting day.